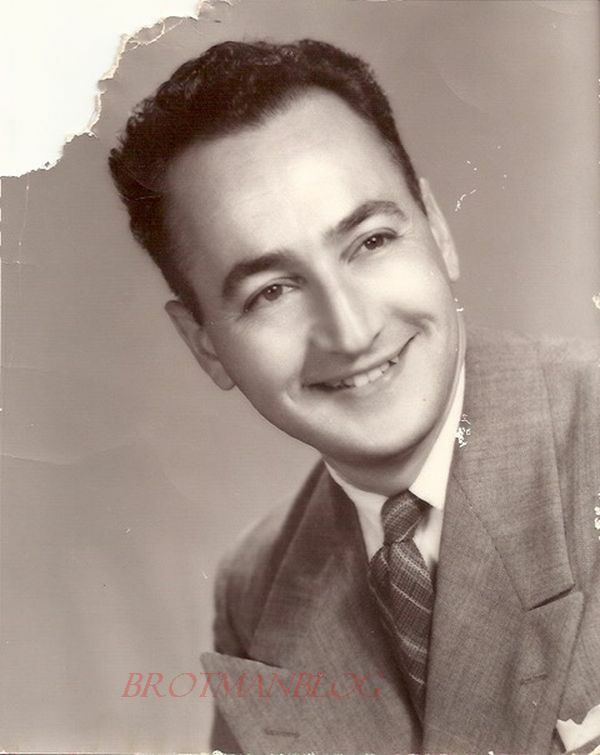 With much love and sadness, I share that my father passed away this weekend after 92 years of a life well lived. He was a man of great intellect, incredible curiosity, a passion for art, architecture, and music, and a lifelong commitment to progressive values—peace, justice, and human rights. 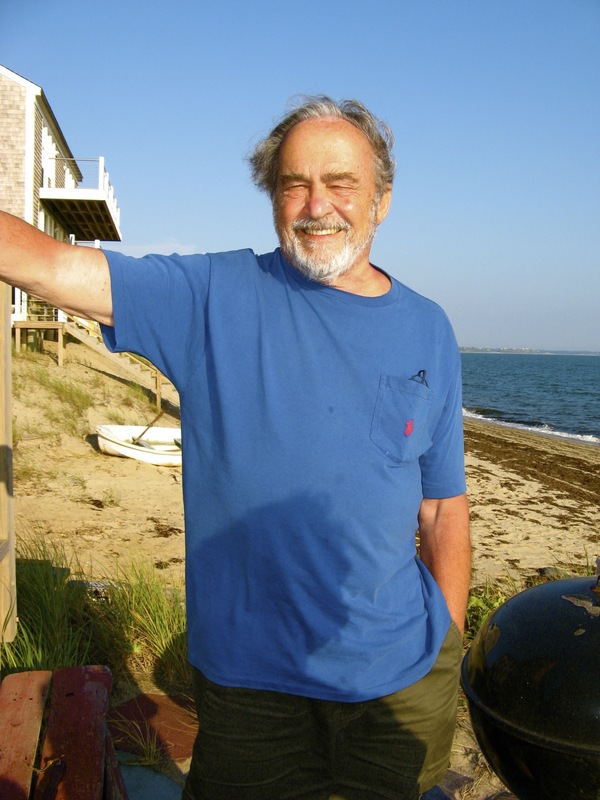 He loved cats and dogs and the beaches of Cape Cod. But above all else, he was a man who passionately loved his family, especially my mother, whom he adored for 67 years of marriage. 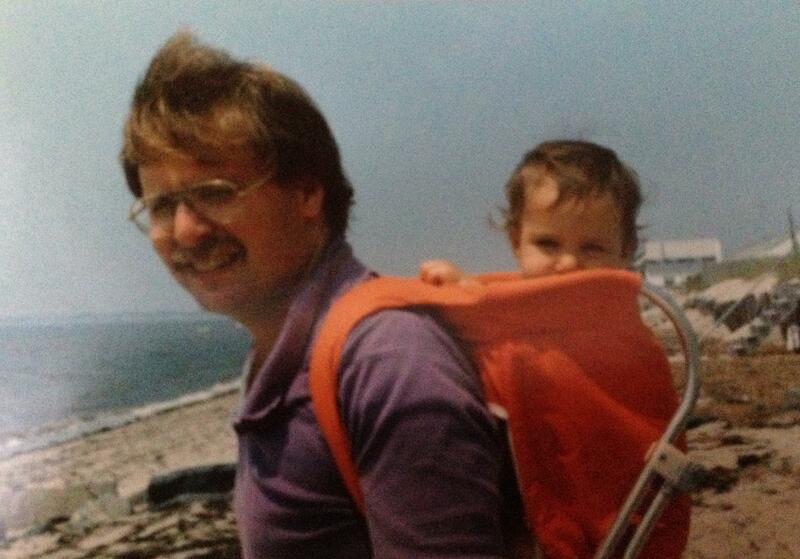 Those of you who follow my blog may have seen the occasional comments my dad left on the blog. 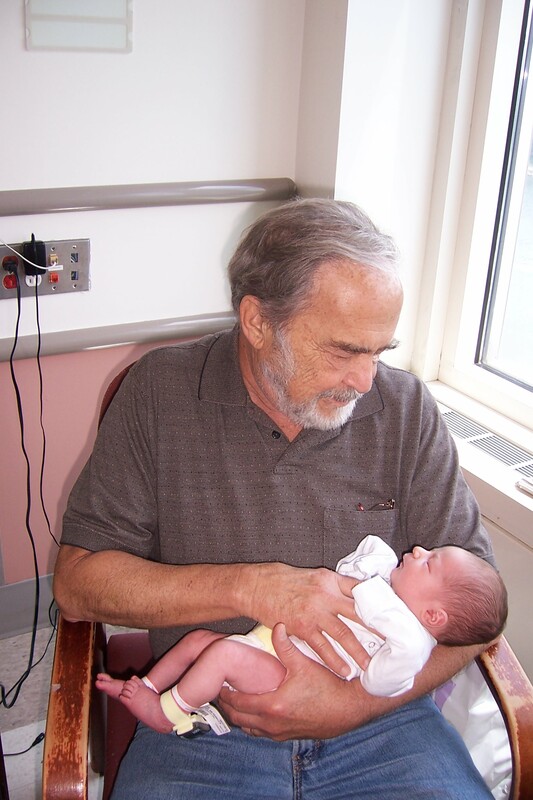 He was a devoted reader of the blog and supportive of and fascinated in the family history I was uncovering. He also was a constant source of information about his family and, most importantly, the inspiration for all the research I have done about all my paternal lines (which is probably 80-90% of what I’ve done since I have had much more luck finding information about my father’s side than my mother’s side). I will miss him deeply and will undoubtedly share more about him as time goes on. 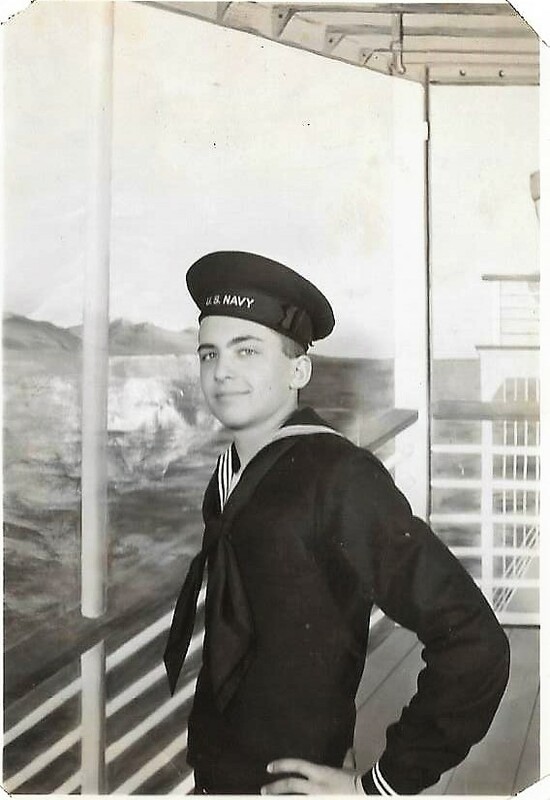 For now I am taking a short break from blogging, but I will return soon because I know he would have wanted me to continue telling the stories of his many relatives. Here are just a few photos. Cohen and Company Photograph: Is That My Grandfather? Hello, everyone! I have returned from my break and am ready to dive back into my exploration of my Goldschmidt/Goldsmith relatives. But before I do, I want to share my second experience working with “Sherlock Cohn, the Photo Genealogist” aka Ava Cohn. In the course of my genealogy research, many cousins have shared photographs with me, and fortunately almost all the time they can identify the people in the photographs. But occasionally I have received photographs with unidentified people in them, and sometimes those photographs just stay in my head and bother me. Who are those people? How can I figure out who they are? 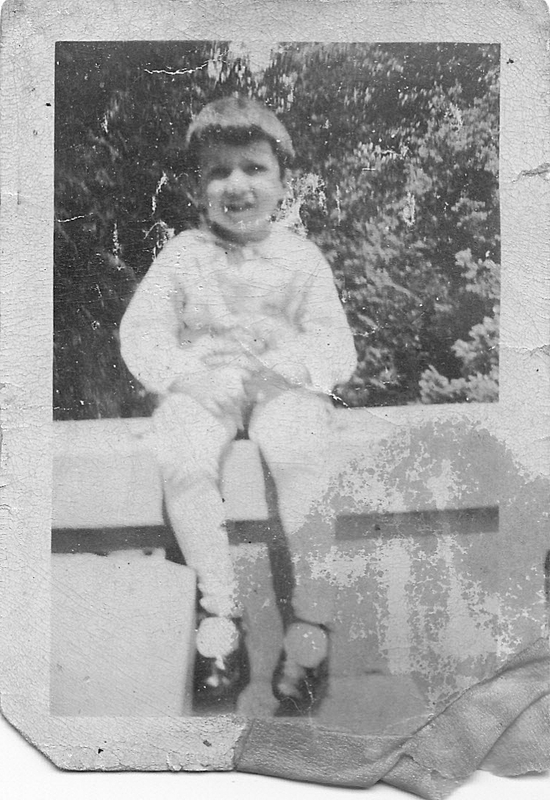 This is one of those photographs, a photograph that belonged to my late cousin Marjorie Cohen, my father’s first cousin, the daughter of Stanley Cohen, my grandfather’s brother. 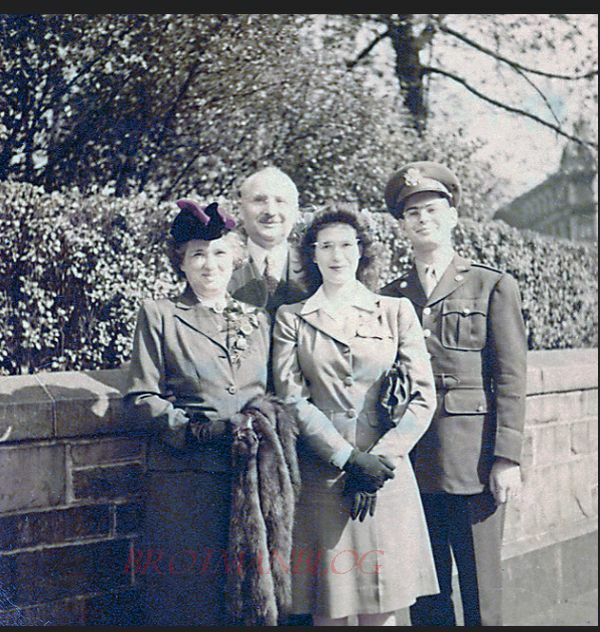 The only person I was fairly confident I could identify in the photograph was Marjorie’s father Stanley, the man on the far left in the photograph. Here is a photograph on Stanley taken just a few years later when he was serving in World War I. You can see the resemblance to the man on the left. 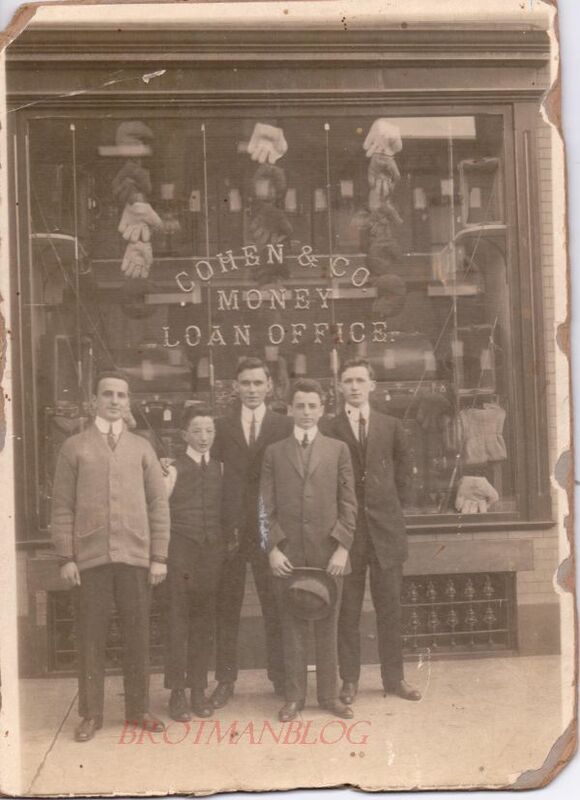 The group photograph was taken in Philadelphia in front of the Cohen & Company Money Loan store, which was part of the pawnshop business started by my great-great-grandfather Jacob Cohen in Philadelphia in the 1850s and then carried on by many of his sons, including my great-grandfather Emanuel Cohen, who ran this particular store. I wondered whether these five men were also grandsons of Jacob Cohen. 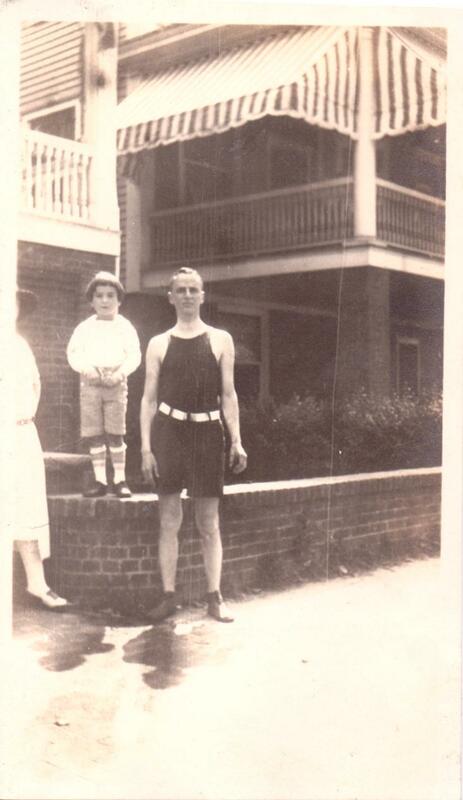 I was particularly curious about whether my grandfather John Cohen was one of the men standing in front of the store. 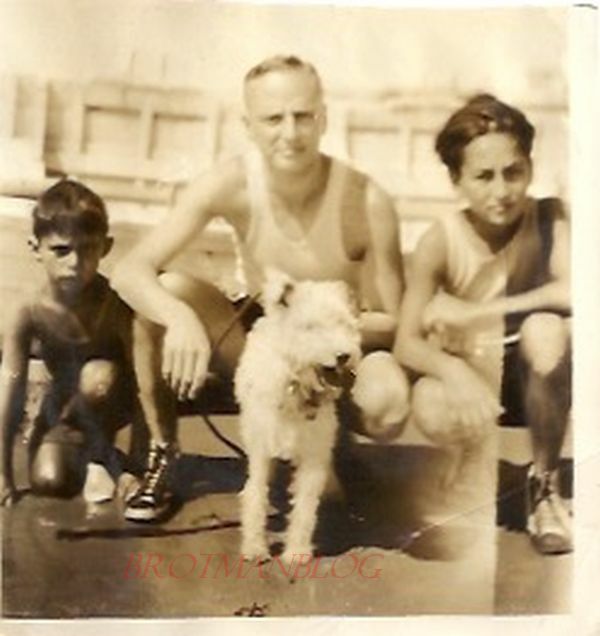 When I connected this summer with my second cousin Marcy, the granddaughter of my grandfather’s other brother, Maurice Cohen, she sent me some photographs of Maurice and of Maurice’s sons, Buddy and Maurice, Jr.
Emanuel (Buddy), Maurice Sr., and Maurice, Jr. 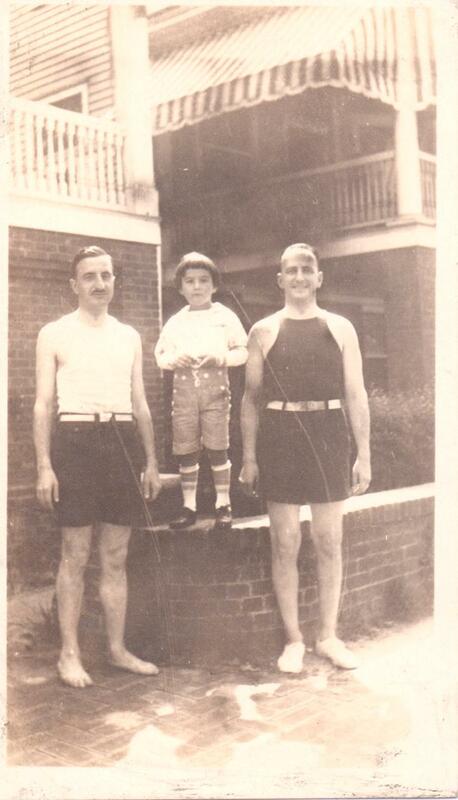 I also had photographs of my great-grandfather Emanuel Cohen, my great-uncle Stanley, and my grandfather John. 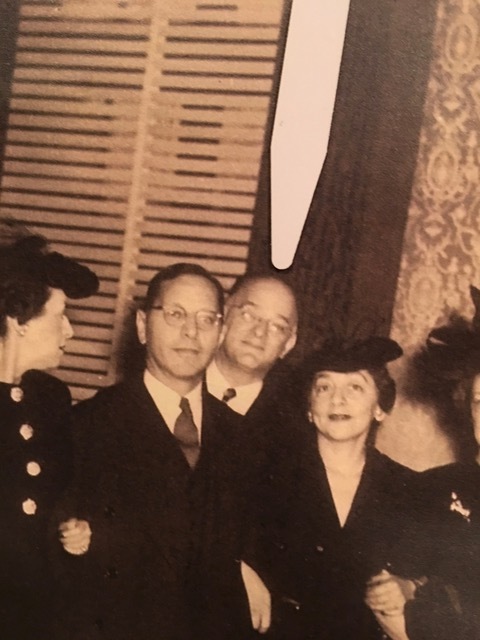 Having had fabulous success with Ava Cohn, aka Sherlock Cohn, the Photo Genealogist, in the past, I decided to have Ava analyze these photographs to see if she could identify the people in the Cohen & Company photograph. Ava’s work is remarkable. Her attention to detail and the research she did to try and answer my questions is incredibly professional and thorough. Although she could not definitively identify all the people in the photograph, she certainly narrowed down the possibilities and made some very helpful and persuasive comments and suggestions. With her permission, I am going to summarize and excerpt from her report. …the scan appears to me to be a brown color, indicating a platinum print (sepia color) used generally from 1880-1930. Platinum prints often fade and there is some fading of this photograph. However, after 1920 most photographs were gelatin silver prints that had crisper black and whites than the platinum prints, another indication that this photograph was taken before 1920. … The photograph was taken outside. Since one of the men is wearing a sweater, it is appropriate to say that the photograph was taken in a cooler month, but obviously not winter. This is consistent with the presumed date of April, 1913. Person A is wearing a coat sweater with V-neckline, knit cuffs, two patch pockets and six buttons. This dates from the 1911-1912 period. 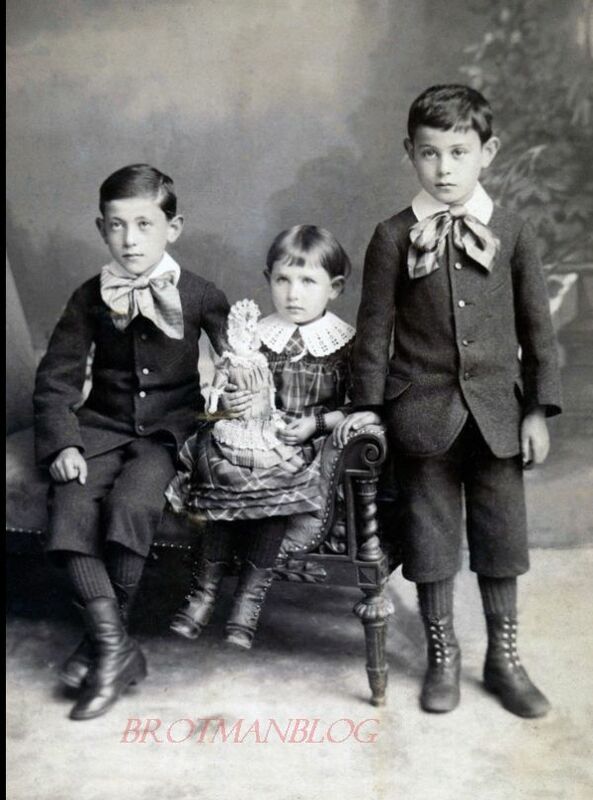 All the men are wearing shirts with detached collars from around 1908 and skinny ties that were popular in 1912. Person B is wearing a high cut vest also with 6 buttons, a style found in ads from 1912. Persons C and E are wearing jackets that are slightly fitted at the waistline. Person D is wearing an older jacket that is less fitted. 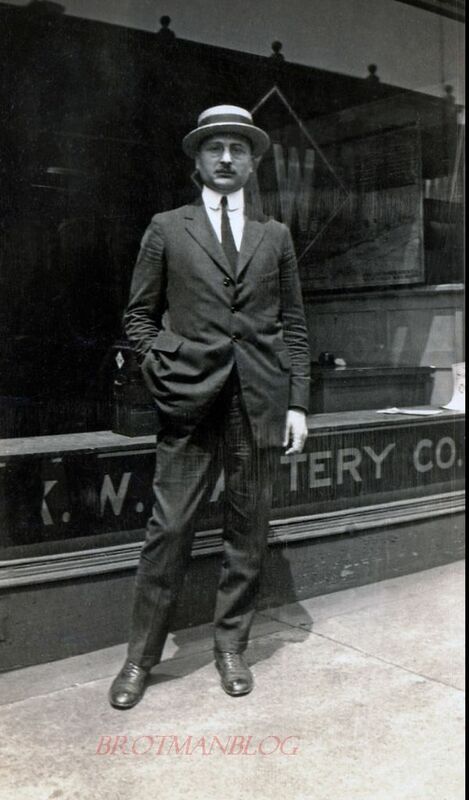 The slightly fitted waist style of men’s jackets was popular from 1912-1915. Also in that time period men’s jackets had 1, 2 or 3 buttons as can be seen on the men’s jackets in the photograph. Person D is holding a soft felt Optimo shape Panama hat from about 1912. Persons A, B, D and E have their hair combed back in a pompadour style with no part. Men wore their hair in this manner in the 1912-1913 period. Person C has a variation of this style with a side part. From these observations, Ava concluded that the date of April 1913 on the photograph was likely accurate. A: 24 years old. 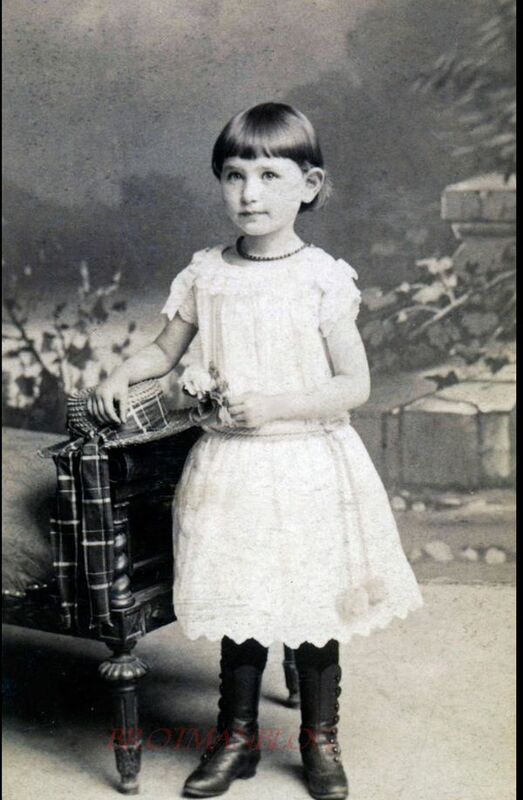 Born circa 1889. B: 15 years old. 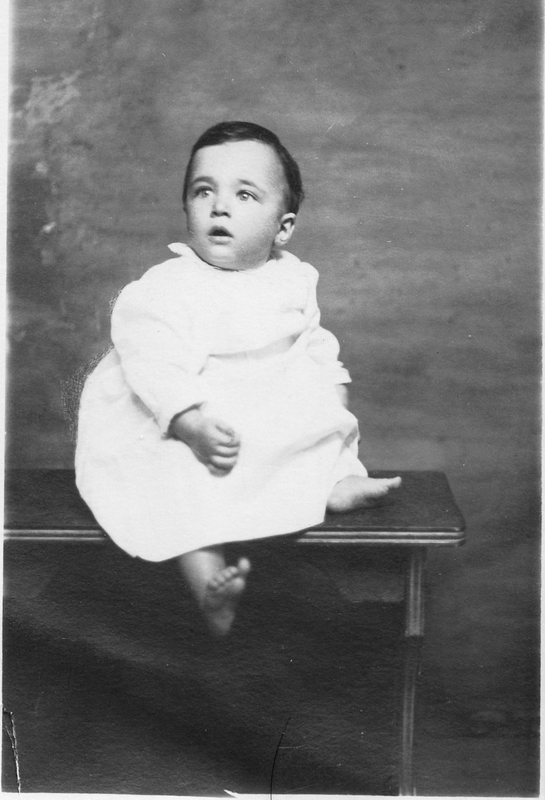 Born circa 1898. C: 24-26 years old. Born circa 1887-1889. E: 25 years old. Born circa 1888. 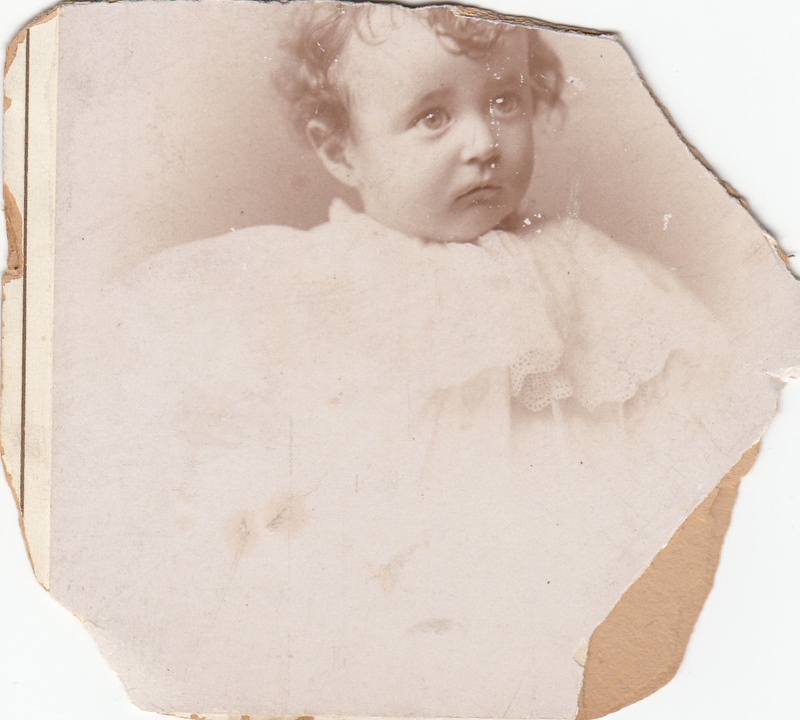 As noted above, I was already reasonably certain based on other photographs that Person A was my great-uncle Stanley Cohen, Marjorie’s father, who was in fact born in 1889. 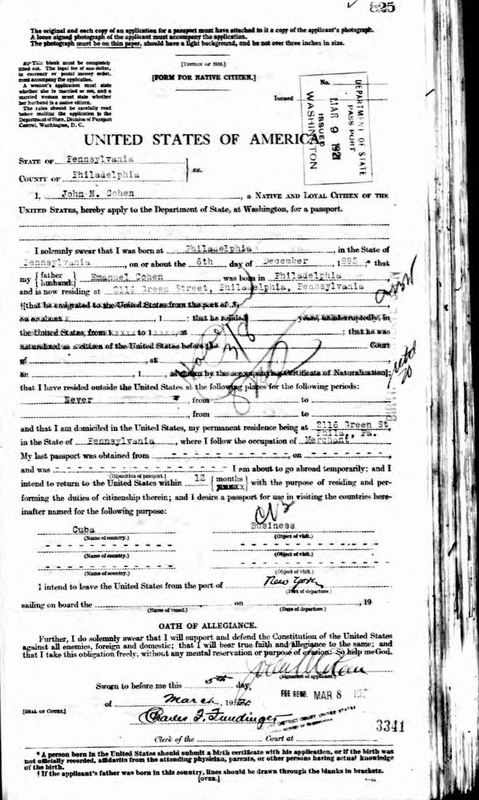 Ava’s analysis further confirmed that conclusion by relying on the physical descriptions of Stanley in his draft registrations for World War I and World War II. The World War II registration indicated that Stanley was 5’9” tall, and from that fact Ava was able to compare him to the other men in the photograph to reach some conclusions about their heights. 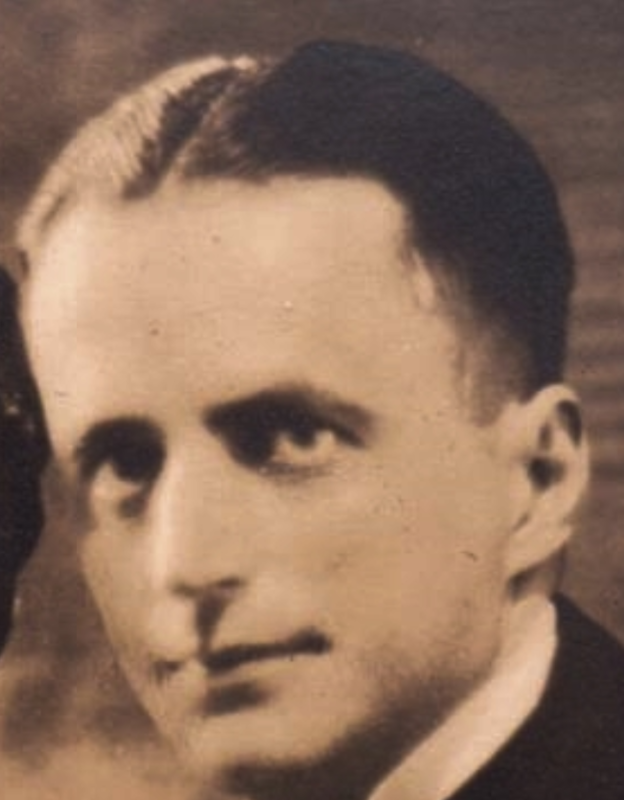 B: Simon LB Cohen, born 1898. 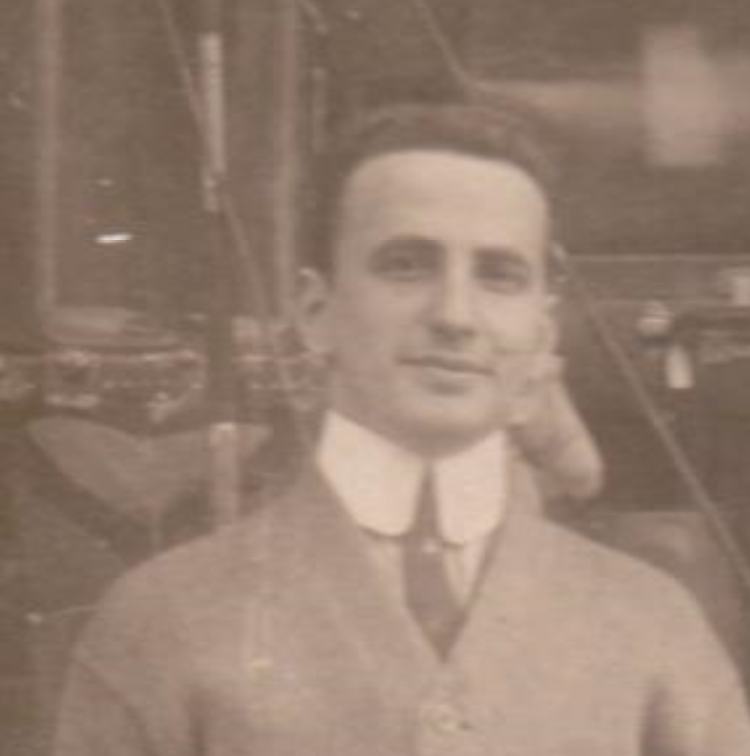 C: Samuel S. Cohen, born 1887. 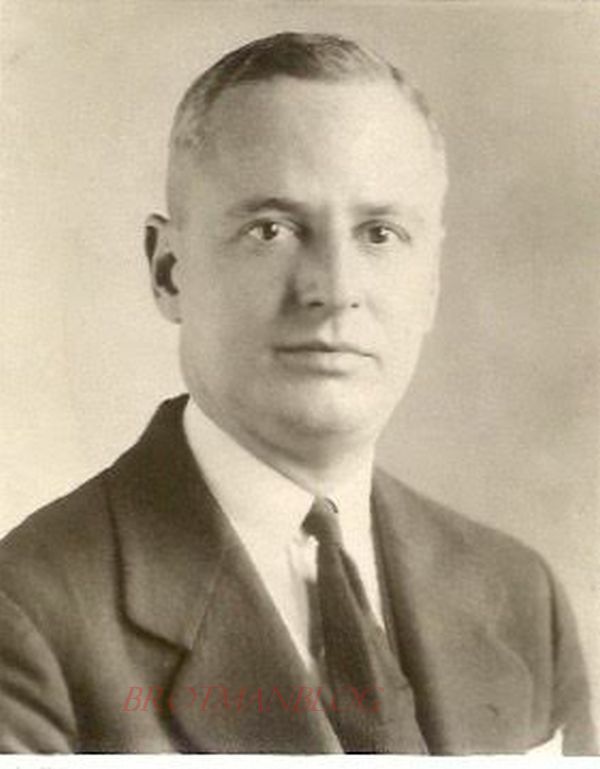 D: John Nusbaum Cohen, born 1895. 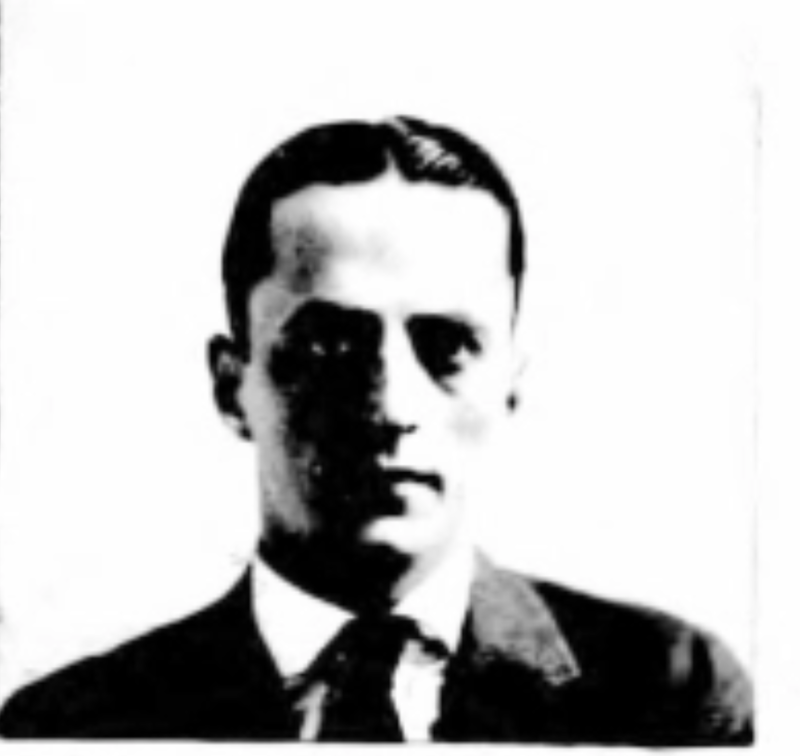 E: Morris N. Cohen, born 1887. 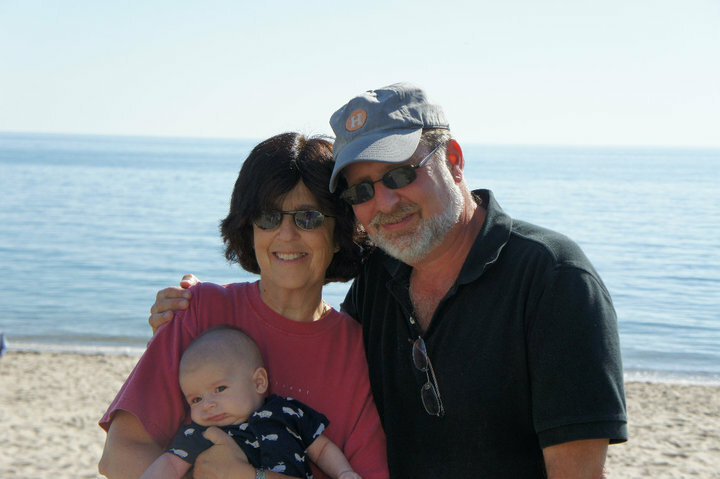 For person B, Ava noted that Simon LB Cohen was the only grandson of my great-great-grandfather Jacob Cohen who would have been that young (roughly 15) in 1913. I would love for that to be Simon because I know so much about what happened to him just a few years after this photograph was taken. Simon served valiantly in World War I, was seriously injured and presumed (mistakenly) killed in action, and was awarded the Croix de Guerre for his bravery. He died as a young man in 1934, perhaps as a consequence of his time in the war. But we can’t be sure that this boy was even related to the Cohens (or that anyone in the photograph other than Stanley was). Perhaps they are just a bunch of friends. But if we assume that they are all Cohens and all grandsons of Jacob Cohen, then Simon LB Cohen is a likely candidate to be person B. 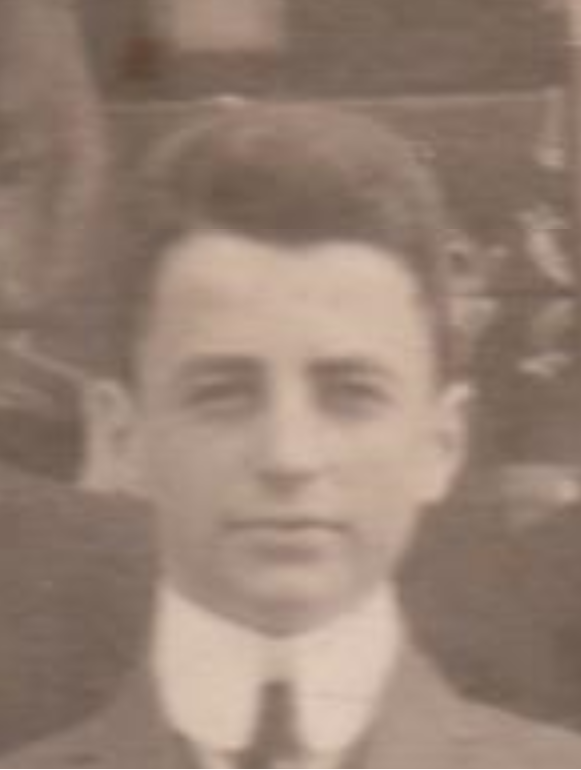 Since there are no draft registration descriptions of Simon nor any photographs, it is impossible to know for sure whether this is Simon in the photograph. I was also very intrigued by Ava’s hypothesis that persons C and E could be the twin brothers, Morris and Samuel Cohen, sons of my great-grandfather’s older brother Joseph Cohen and grandsons of my great-great-grandfather Jacob Cohen. 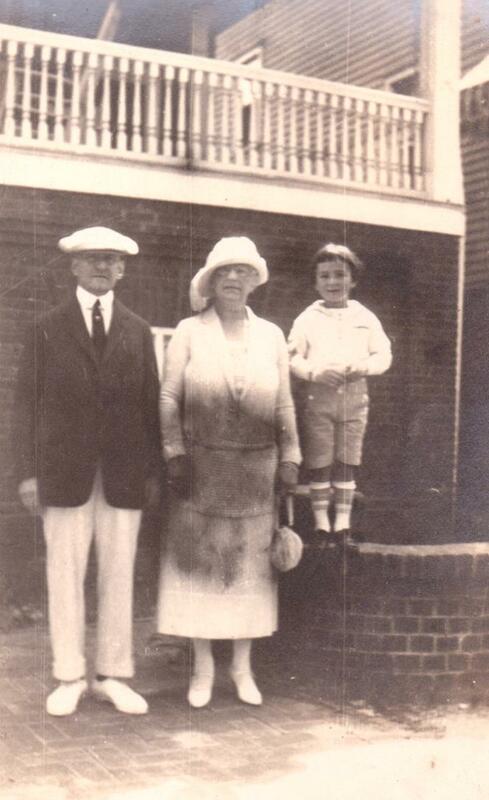 Morris and Samuel were born on August 22, 1887, in Cape May, New Jersey, but in 1910 they were living with their parents in Philadelphia, both working as salesmen in a department store, according to the 1910 census. Ava thought that although they were not identical, they did look like brothers and appeared to be about the same age—24 to 26 years old. 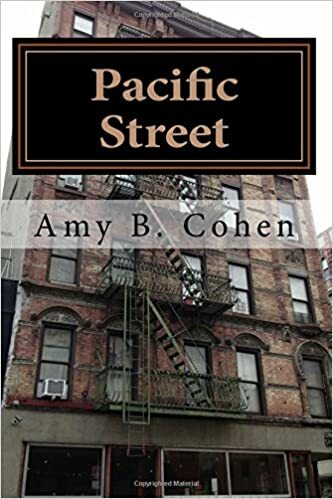 Ava’s analysis seemed very convincing, so I was motivated to search for descendants of Morris Cohen and Samuel Cohen to see if they had any photographs of the twin brothers. With the help of a good friend who knew one of Samuel’s grandchildren, I was able to make a connection. Unfortunately the grandchildren’s memory and photographs of their grandfather Samuel (displayed below) did not confirm that he was either Person C nor Person E in the photograph so I am back to square one in identifying those two men. But it was Person D I was most interested in, as I hoped he was my grandfather John Cohen, who would have been almost seventeen and a half in April 1913 and thus close to the age of Ava’s estimated age of Person D. Also, Ava pointed out that on his 1921 passport application, my grandfather’s height was reported to be 5’6” and that his World War I draft registration described him as short; certainly Person D is a shorter man than Persons A, C and E. Those two factors pointed to Person D being my grandfather. But comparing Person D to the photographs of my grandfather created doubts for Ava (and myself) as to whether Person D was my grandfather. 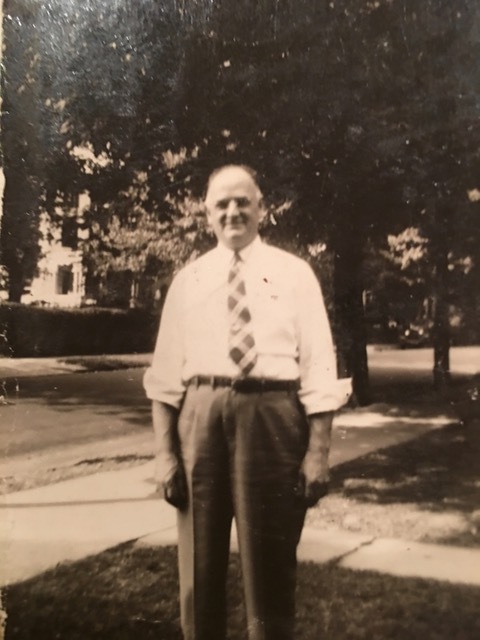 My grandfather had very distinctive eyes—very deep set and slanted down; Person D is squinting, making it hard to see his eyes, so it is hard to tell if they are the same as my grandfather’s eyes. Ava also pointed out that Person D has a widow’s peak whereas there does not appear to be a widow’s peak in the photographs of my grandfather. 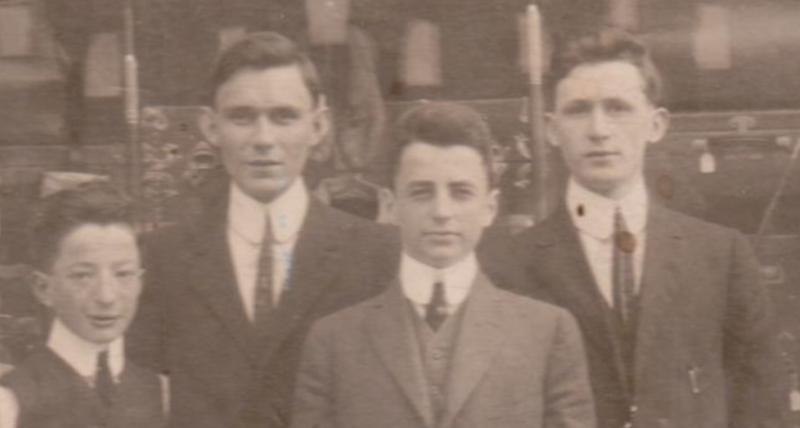 Here is a closeup of Person D and then several of my grandfather—in 1921,1923 and 1930. In addition, Ava believes (and I agree) that the man holding a baby in the fifth photograph is probably my grandfather. I know we see what we want to see, but the more I study these, the more I think Person D might be my grandfather. The loss of the widow’s peak could be from his obviously receding hairline. Look at the difference between 1921 and 1923. 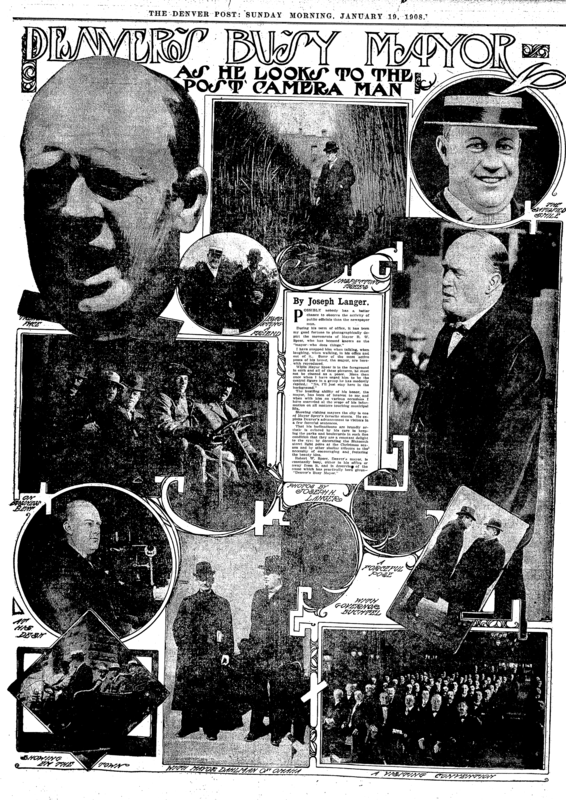 In 1930 he is wearing a hat—perhaps to hide his balding? 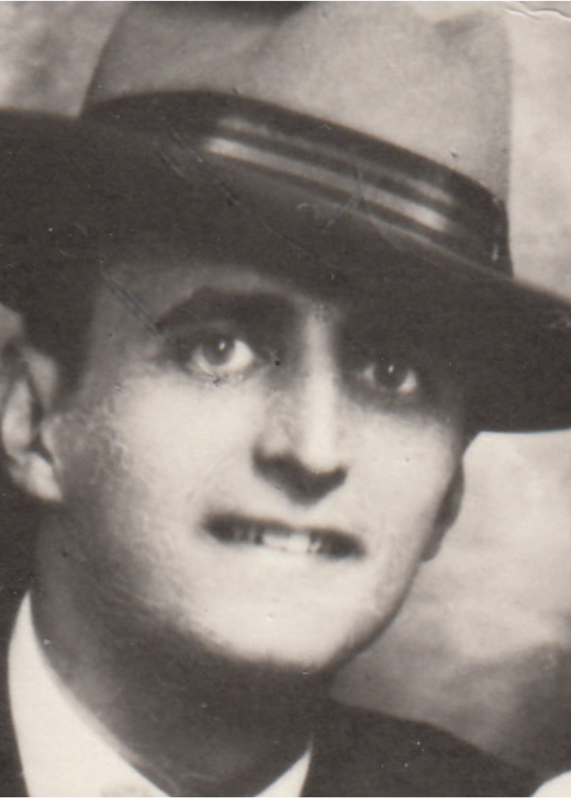 One other thing I noticed in the photographs of my grandfather—he had attached earlobes. Unfortunately when I zoom into the Cohen & Company photo, it’s hard to tell whether Person D also has attached earlobes. 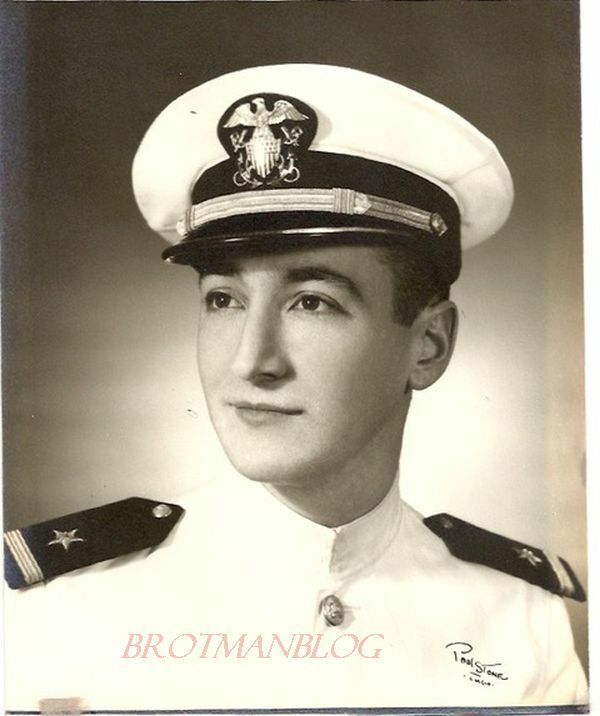 Could this be my grandfather John Cohen? And who is the baby? I now believe that Person D is my grandfather, but I know that that’s what I am hoping for so I don’t trust my judgement. Ava was not certain, but thought it was possible. Although it was not possible for Ava to identify all of the people in the group photograph, she certainly narrowed the field and provided solid and convincing reasons for her conclusions. Thank you, Ava, for a wonderful job on this extremely difficult project! The man who was heading the company, supposedly an old friend of Manek whom we trusted, in fact idolized, turned out to be an embezzler. Not alone did he cheat the firm out of huge sums, but also my hard earned savings which I had given him, believing his promises of a speedy return. Besides Manek had signed notes for him and it took a long time to pay these off. But it was not the money but the great disappointment in a man, a close associate for years who took such an advantage of us, his true friends. Manek had a heart to heart talk with Mr. Paepcke, in case this gentleman should harbor any doubt about him, in which case he would resign. But Mr. Paepcke not only expressed his full confidence but made Manek the head of the company, which he built up to a very successful enterprise -earning the respect of all associates and the community. We worked hard and there were many obstacles to overcome, but Manek met the challenge with perseverance. His kindness and generosity knew no bounds as well as his understanding, from the lowest laborer to the chairman of the Board. Thus, as my mother would say, from bad came good. 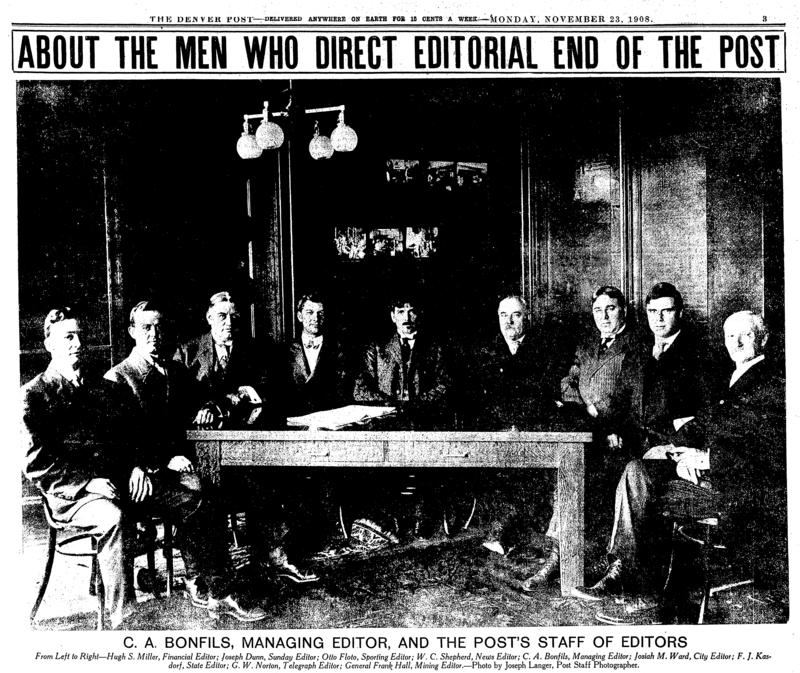 The loss of the money and the betrayal by their friend led to Emanuel’s promotion to president of KW and a long and successful career there. 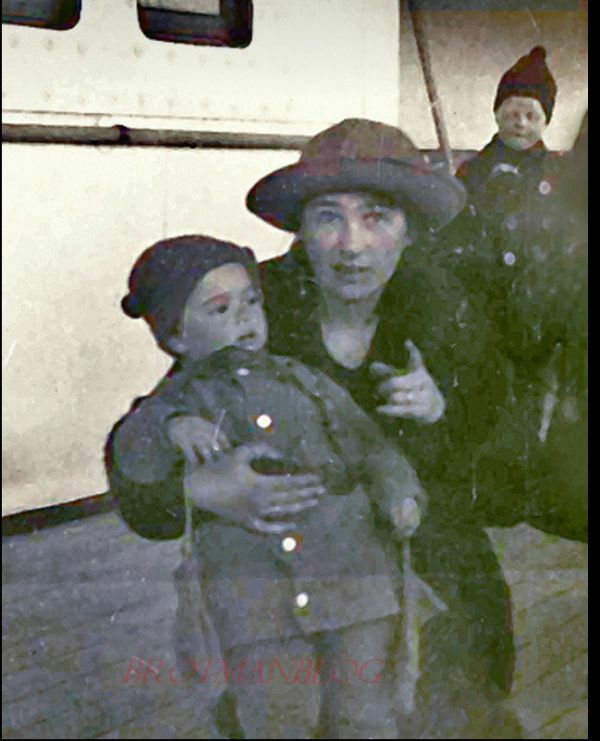 Frieda and Emanuel’s son Walter was born on August 6, 1920, and when Walter was 20 months old, Frieda took him to Europe to meet her family as well as Emanuel’s family, whom she herself had never met. 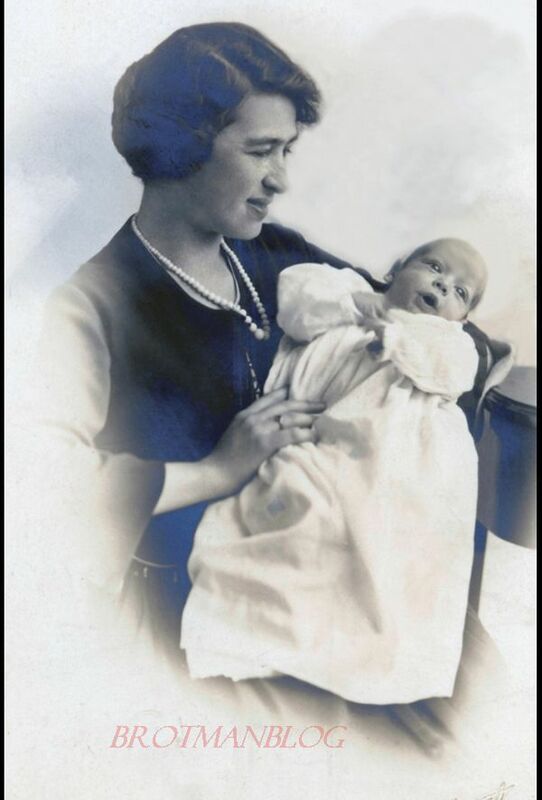 Frieda Loewenherz and her infant son Walter, 1920. Uncle Julius [Mansbach, who had met her at the ship in Hamburg] took me all the way home to my parents in Melsungen. I can’t describe our emotions, they remain unforgettable! As I write this, more than 48 years later, I am reliving those days and weeks. Alas, the end was sad. My dear, gentle mother passed away, quietly and peacefully. My father, sister and everybody else who knew her said that her desire to see me and baby kept her alive and the fact that this wish was granted her alleviated my pain. 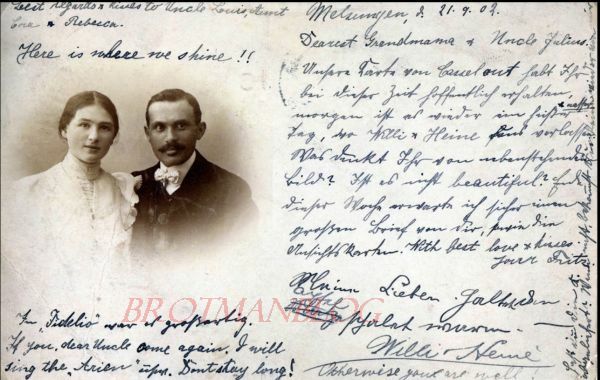 After some weeks in Melsungen mourning with her family, Frieda took Walter to Vienna where she met for the first time Emanuel’s mother Charlotte and brothers Henryk and Josef, Henryk’s wife Rosa and their son Richard, and Josef’s wife Sofie and children Ada and Siegmund. 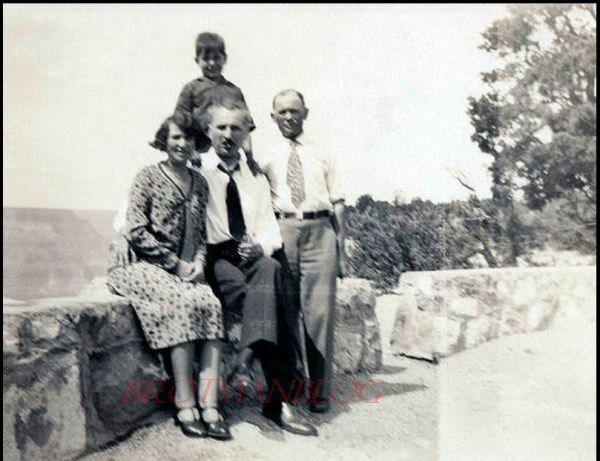 After a wonderful visit with them, she and Walter visited her uncle Julius Mansbach and his wife Frieda (her cousin) and their son Alfred. 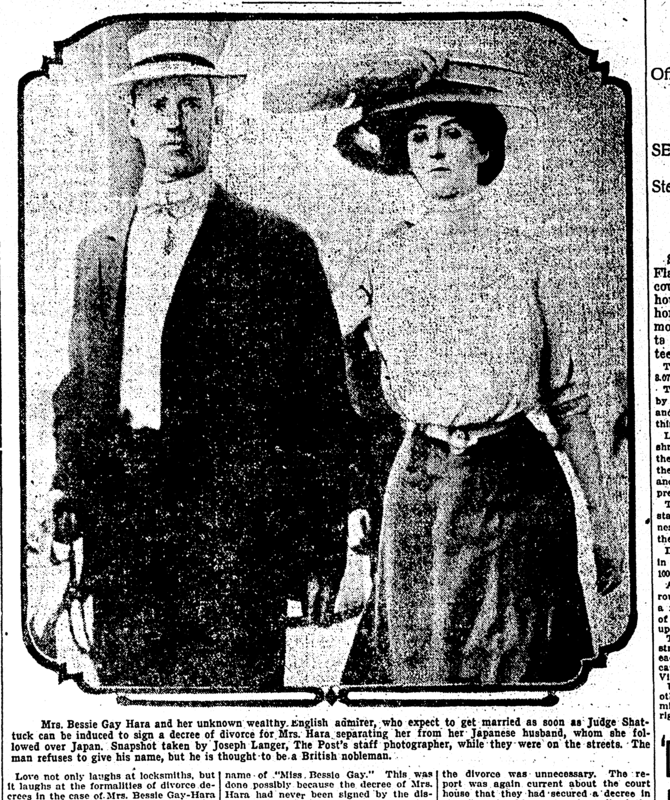 She then returned to Chicago and her happy life with her husband. 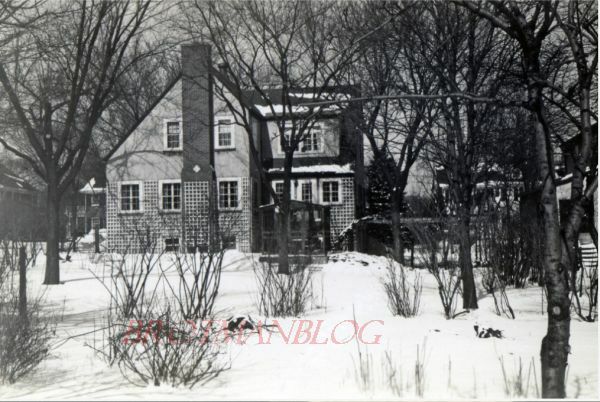 In 1929, they bought a house in Winnetka, Illinois, that would become the long-time family home. 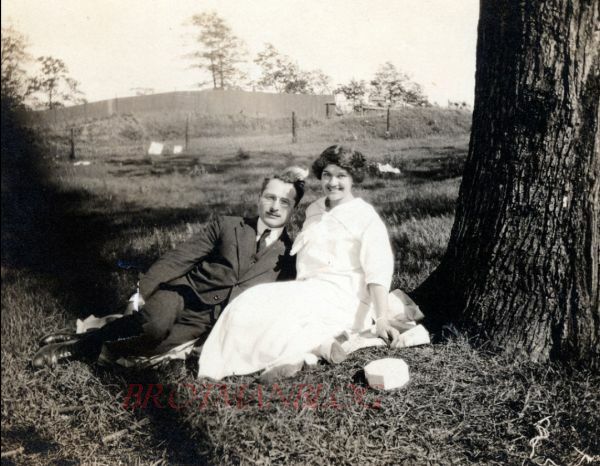 Two months after moving in, Frieda’s cousin Alfred Mansbach, son of her uncle Julius and her cousin Frieda, came from Germany and moved into their home. Walter was in 4th grade in Greeley School and we sent Alfred, although he was 19 and had finished the “Gymnasium” (High School) in Germany, to New Trier High school for one semester, to get an idea of our schools and help his English. The following year he entered Northwestern University as freshman. 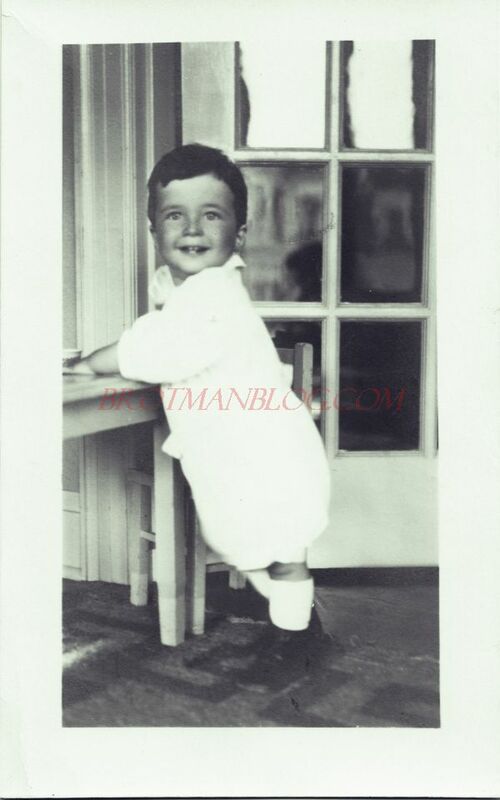 In 1932 Siegmund came to us from Vienna. By then Alfred had moved to Chicago and was working and also taking courses in air conditioning – an industry in its infancy. Siegmund went to Northwestern University School of Music and also to English classes. But Hitler had taken power in Germany, and there were serious concerns about his intentions. It was the spring of 1934 and Hitler had been in power in Germany a whole year. Manek was very apprehensive but [his brother] Josef did not think he would ever attack Austria. – How right Manek was – he pleaded then with the folks to get out of the country, to no avail. Grandma Charlotte could not even think of it- at her age. Josef was still convinced that Hitler would leave Austria alone – how the picture changed in a few years. The next day we were welcomed at the Danzig Station by [Emanuel’s brother] Henryk. There we saw the first Bravo-shirts — I almost felt sick to my stomach. Danzig was already under the influence of Hitler, with Hitler youth, marching and Nazis in the higher echelons – Henryk lived in Oliva which was Polish a short train ride away. We were happy to be together but that cloud of Nazism hung over us like a dark shadow. Dr. Greg from Cologne came to see us there … to persuade us to come to Cologne and be his guests. I was frank to state that I felt uneasy about it and feared that he might get into difficulties for having Jewish guests. He answered, “Nobody is going to dictate to me whom I can invite.” So we promised to come. -The days passed pleasantly – we did not fathom then that it would be our last visit together– We made a stopover at Berlin and visited my nephew Alfred [Stern, son of Frieda’s sister Roschen] and his wife Rita. It seems all we saw was uniforms and Nazi banners. – We were glad to leave although Cologne was not much better. Since Frieda mentioned her nephew Alfred but not her sister Roschen, I have to wonder whether Roschen was no longer living by the spring of 1934. It remains the one big unsolved mystery of my Bensew relatives—the fate of Roschen Bensew Stern. 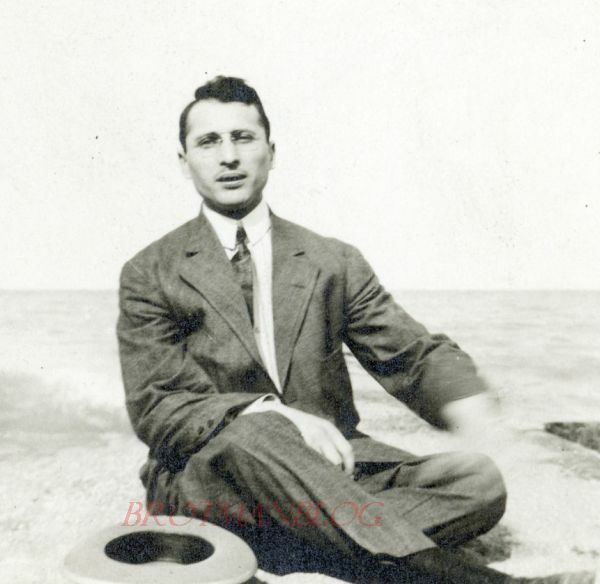 Three years later, Frieda lost her beloved uncle, Julius Mansbach, who had returned with his wife Frieda to the US just a few years before to join their son Alfred in Chicago. 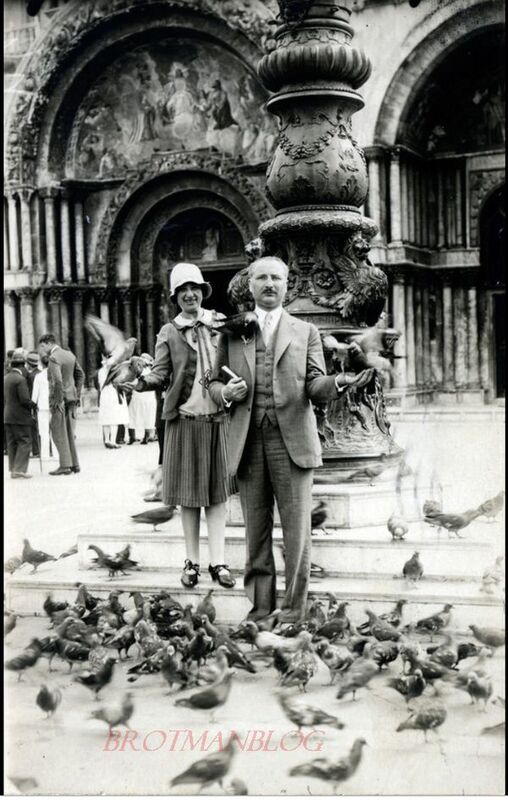 In the spring of 1937 we planned to go to New Orleans for Walter’s Easter vacation. We did sightseeing for 2 days, then a telegram arrived from Alfred that his father had passed away suddenly. The shock was awful – He and Frieda had seen us off at the station and had all kinds of plans for our return. 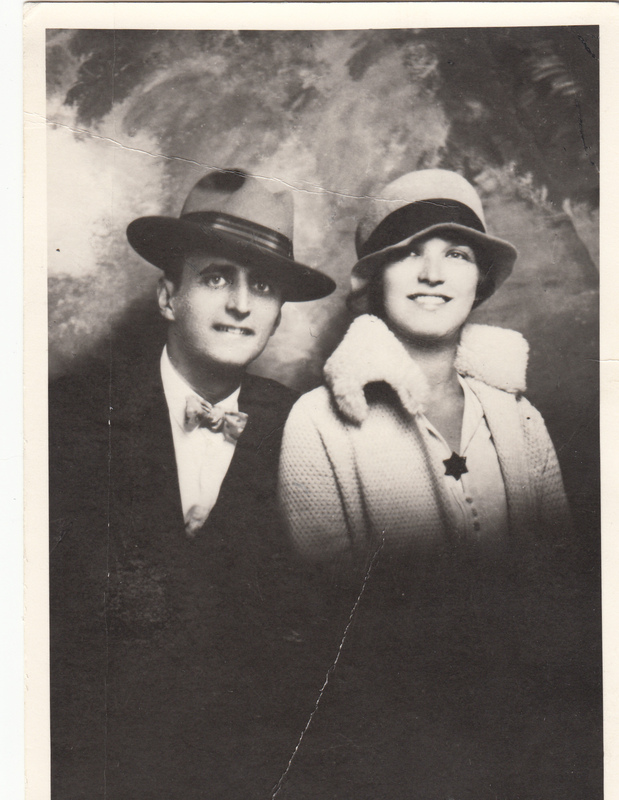 We took the freight train back to Chicago – Frieda [Bensew Mansbach] was numb with grief and I just could not accept the thought never to hear Uncle Julius’ voice again. He was so gay when we left, had all kinds of little packages for me “to open on the train,” he loved surprises – I don’t want to dwell on this sad time. Meanwhile, things in Europe were getting more and more ominous. Conditions in Germany were getting worse for the Jews and we made out many affidavits for family members. 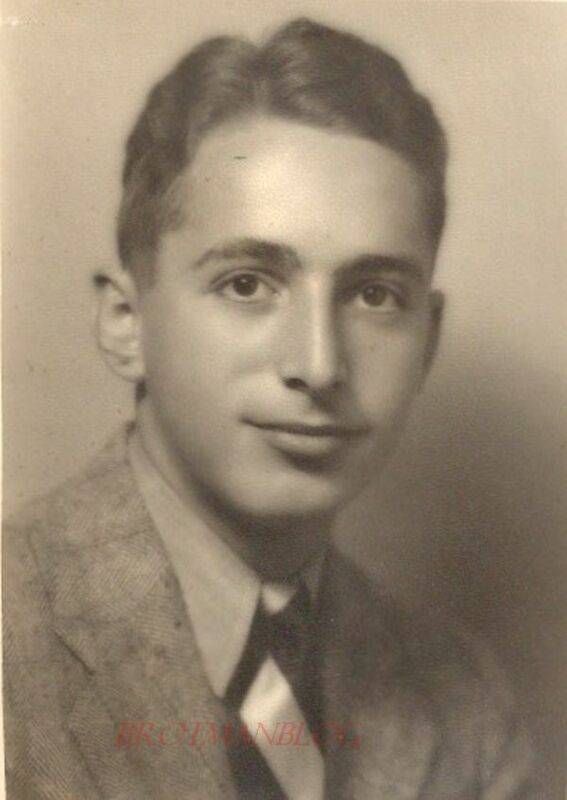 The first to come was [Emanuel’s nephew] Richard in July 1937 – he had finished his studies at medical school and was interning in Vienna for a short while before.–He-stayed with us until he got an internship at a hospital in Chicago. In March 1938, catastrophe struck Austria; Hitler marched into Vienna! The persecution of the Jews cannot be described. Josef together with all the leading members of the community was jailed for weeks. It became imperative to get Siegmund out as quickly as possible, perhaps with Ada. [Josef’s children] [Siegmond arrived in] July… Ada arrived in the U.S. in August. …. In August 1939 Hitler invaded Poland and occupied it. Luckily, Micha [son of Emanuel’s brother Henryk] who was born in Danzig, could get a visa and he left the end of August. 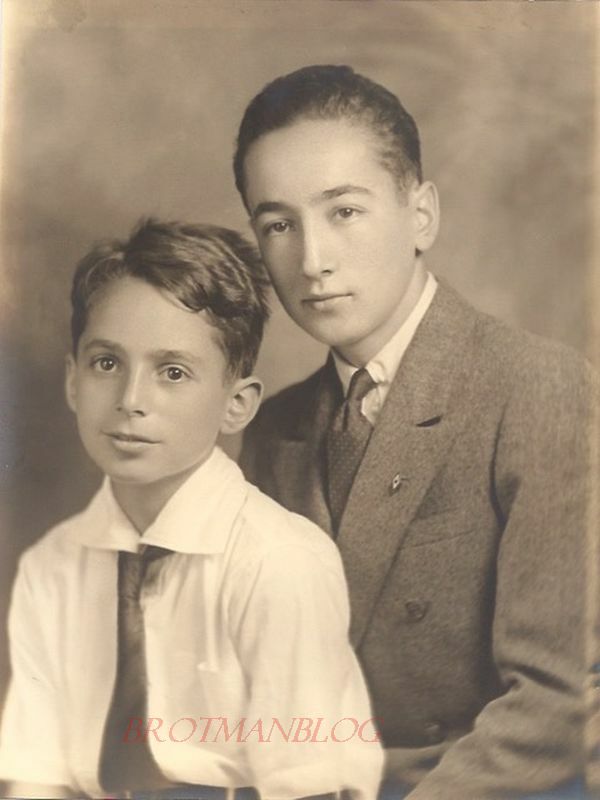 While en route, the war in Poland broke out but he was safe and arrived in New York on Sept. 3.- Manek and Walter met him, a 13 year old [boy] … It was a new experience to have another adolescent in the house and under such circumstances. We knew how hard it was for his parents to part with him and we did everything to make him feel at home. Since he did not speak English, it was fortunate that we could make his adjustment easier by speaking German to him and Walter was a real big brother to him. Emanuel and Frieda had done everything to rescue the Loewenherz relatives in Europe and had largely succeeded. The children of Josef and Henryk were all safe—Siegmund, Ada, Richard, and Micha (who became Michael in the US). 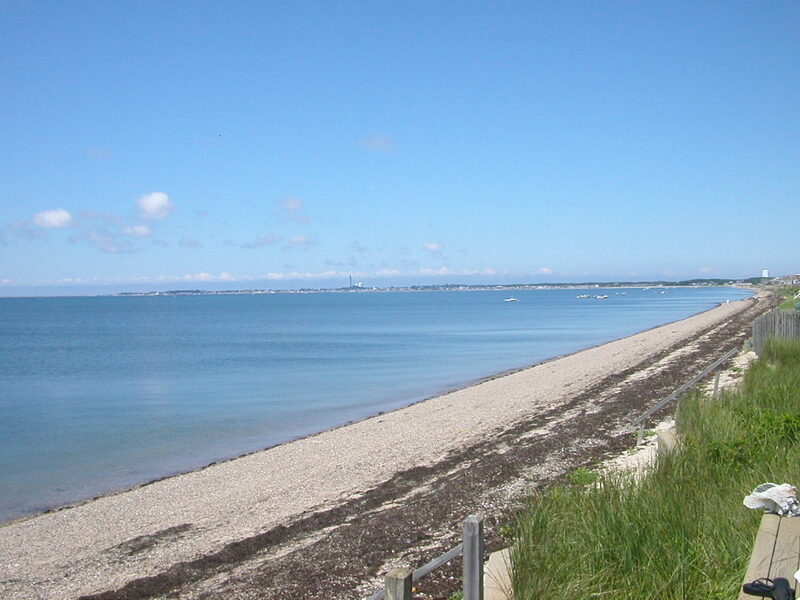 Many people fled without visas in small boats to Denmark which was so close and Denmark was most hospitable to Jews and hid them from the Nazis. But Henryk wanted to have official permission and our efforts, as well as Josef’s from Vienna were without success. And then came their notice that they were leaving for Cracow- From then on news were scarce, a card now and then. Finally, when we received permission from the British Consulate for a transit visa to England, it did not reach them any more – they had left Cracow- destination unknown. Emanuel’s other brother Josef and his wife Sofie were still in Vienna, trying to get out. Then in December 1941, the US entered World War II. Our lives were changed. Manek worked harder as war orders had to be filled, and restrictions in the economic appeared soon, although there was no food shortage. We could not communicate with the folks in Vienna. In January or perhaps later (I am not certain about the exact date) we were at war with Germany too) and the gigantic war machine was in full swing with all the heartaches, anxieties and hopes for an early peace– Everybody worked for the Red Cross- I knitted day and night, helmets, gloves with trigger fingers, scarves, sweaters, etc. …. Walter knew he was going to be drafted. Meanwhile he continued school, hoping to finish. He had become friends with Bea, also at Northwestern U. in the School of Education. 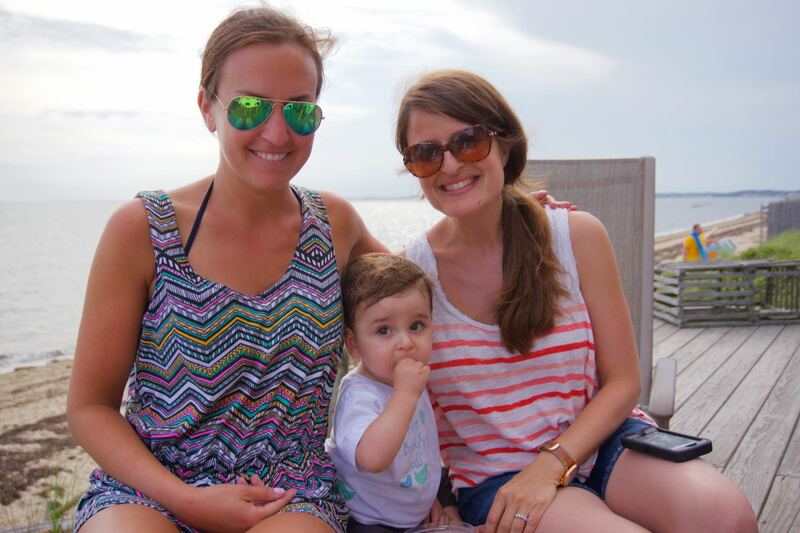 It was not too long until the friendship ripened and the outcome was their engagement after Bea graduated in June. Walter graduated in August. We were happy about it, although we knew that Walter would soon be drafted. It happened in Sept. and he was sent for basic training to Fort Lawton, Oklahoma. … We had, in addition the worry about the folks in Vienna. On top of all this stress, or maybe because of it, Emanuel suffered a serious heart attack in December, 1942. 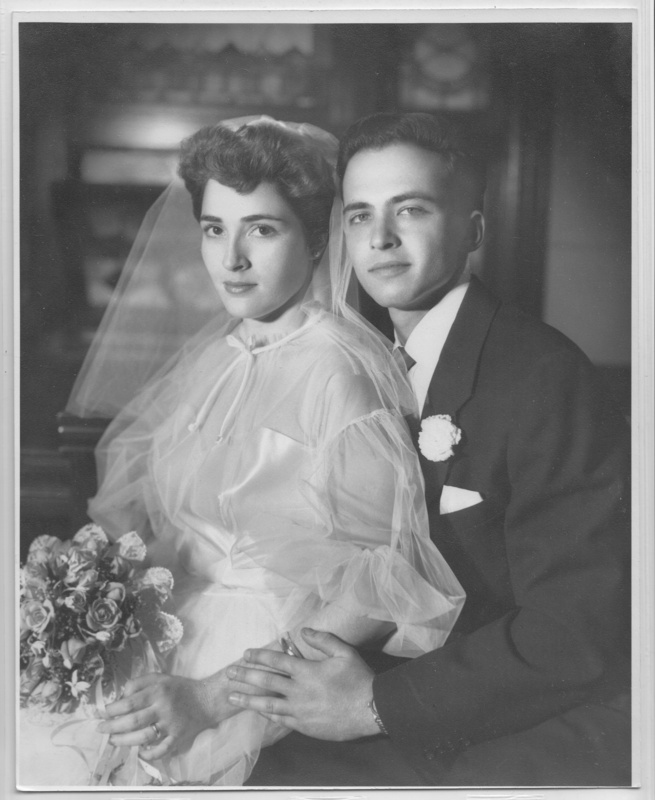 Fortunately he recovered, though he and Frieda could not attend Walter and Bea’s wedding in Oklahoma on March 20, 1943. 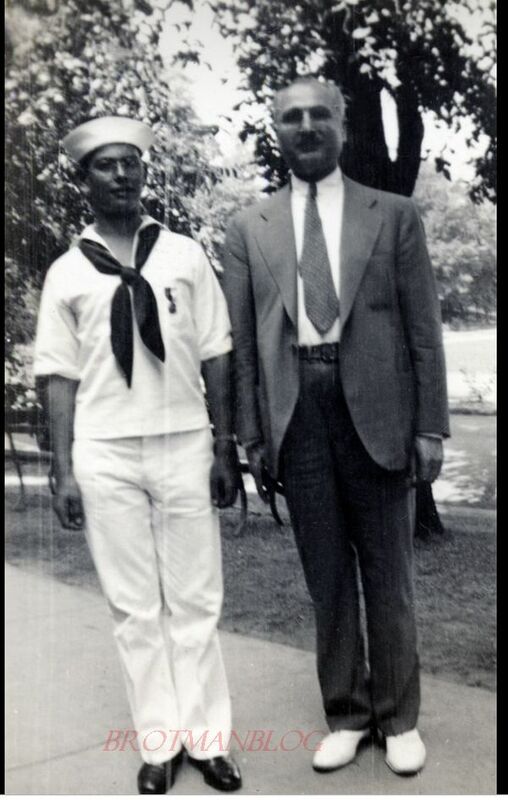 One had to accept this too – we were happy and grateful for Manek’s recovery and it was only a short time when Walter was ordered to the Officer’s Training School outside of Washington. 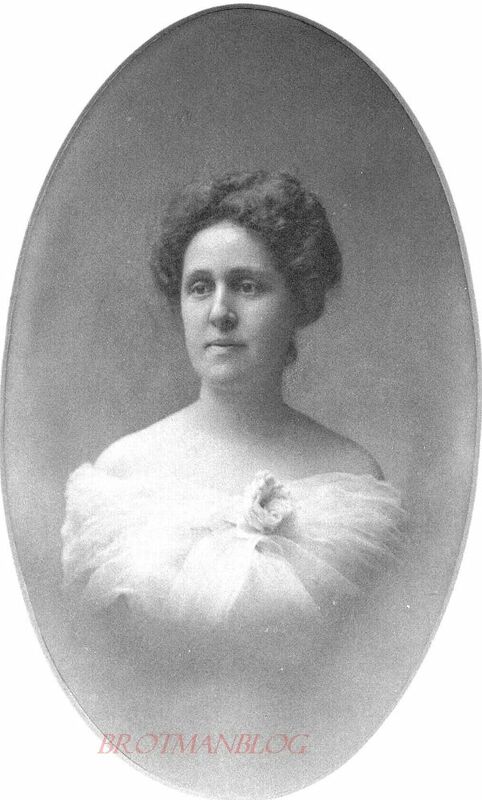 Bea rented a room in Washington and did research work on her Master’s thesis. 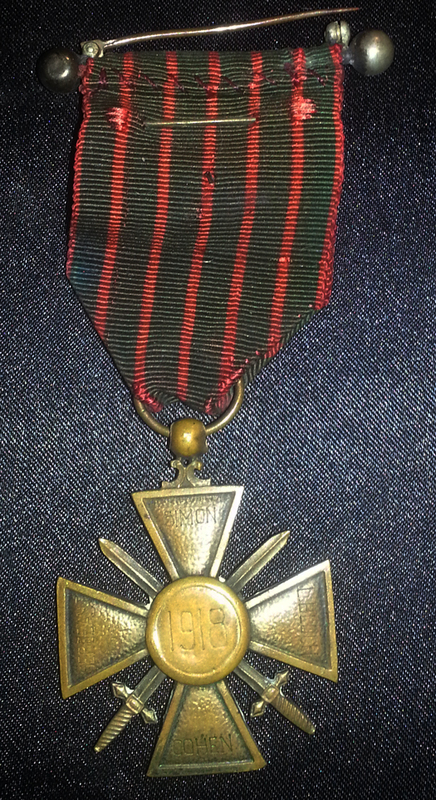 In June Walter was made 2nd Lieut. in G2 (Intelligence) and received a week’s leave which they spent in Winnetka. His first assignment was at the Brooklyn Army Base and they were fortunate to get an apartment there. 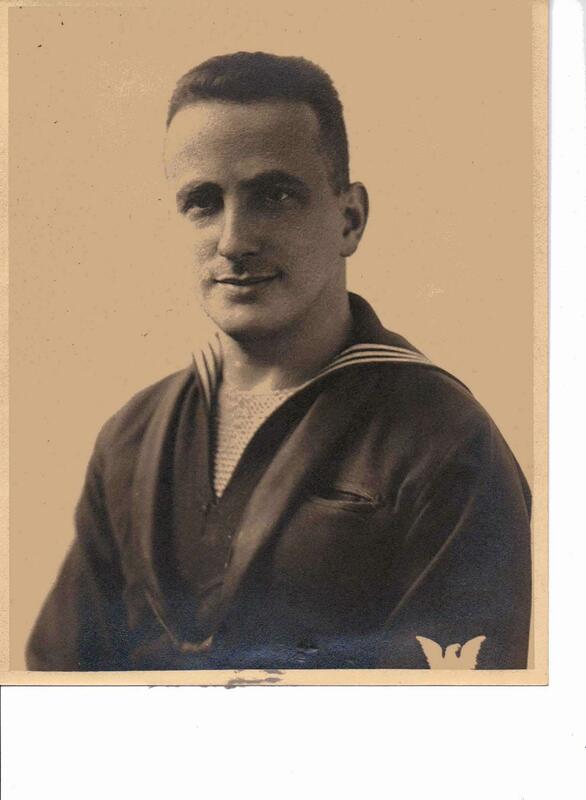 … As he was specially trained because of his knowledge of German we figured that he would be sent to Europe, but he was sent to the Pacific in October. What we dreaded was true – they were sent to the extermination camp. 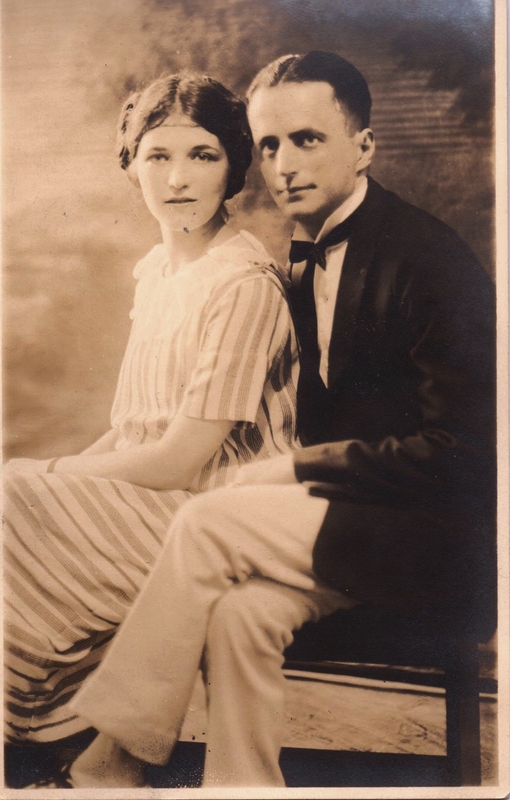 According to the Yad Vashem database, Henryk and Rosa were murdered at Auschwitz in 1942. But Frieda was overjoyed to learn that somehow Josef and his wife Sofie had survived the war. (She did not go into details about how they managed to escape from the Nazi death machine.) Josef and Sofie came to the US and were reunited with their children, who were now grown adults. After the war, life returned to peacetime conditions, and in the years that followed, Frieda and Emanuel were blessed with many grandchildren and a meaningful and joyful life. 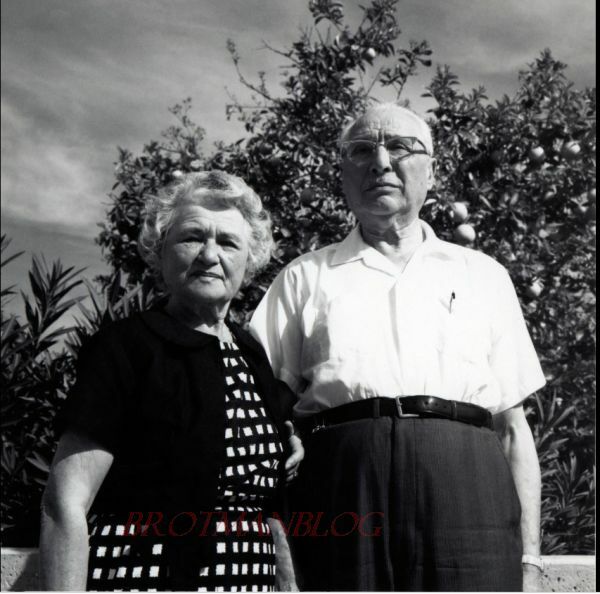 Walter worked with his father at KW, eventually taking over the company and freeing Emanuel and Frieda with more time to travel in retirement. Frieda was heartbroken when her beloved Manek died on December 22, 1963. My world had crumbled and I did not know how to cope with what was left – then I did realize that Manek would want me to go on, as he so often emphasized in our conversations in our happy days. We used to discuss life from every angle and every phase of it and I admired his philosophy and his clear, human outlook. But above all was his deep love which I shared for over 45 years – how many people are that fortunate? And that helps me to go on, it is something precious and all my own. Reflecting back on her life after reading this memoir several times now, I continue to be moved to tears and feel goosebumps as I do. 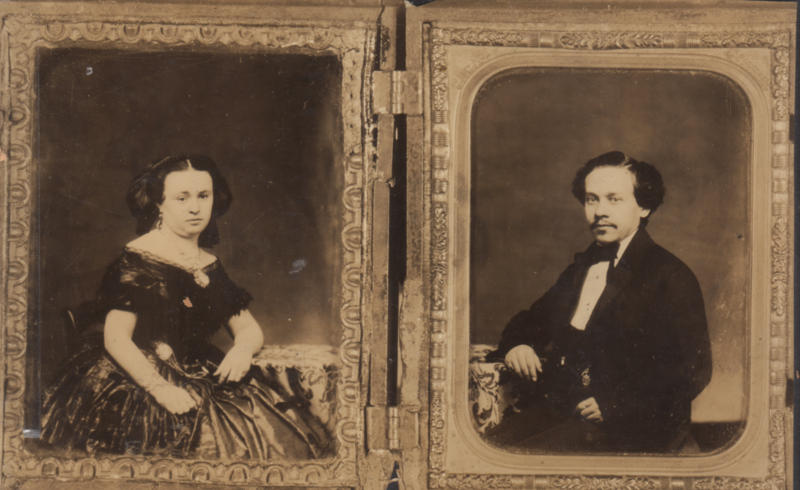 Frieda and Emanuel lived an incredible life together. Theirs was a true love story. But they were much more than that. Their love was not limited to love for each other, but for their entire extended family—the Mansbachs, the Bensevs, and the Loewenherzs. They made sure to stay connected to them all despite all the distances and obstacles. And they did what they could to rescue their family members in Europe and opened their home over and over again to those beloved family members. Despite all the evil they saw—the discrimination they personally faced during World War I and the hateful destruction of Jewish life in Europe under the Nazis—they remained positive, life-affirming, and loving. 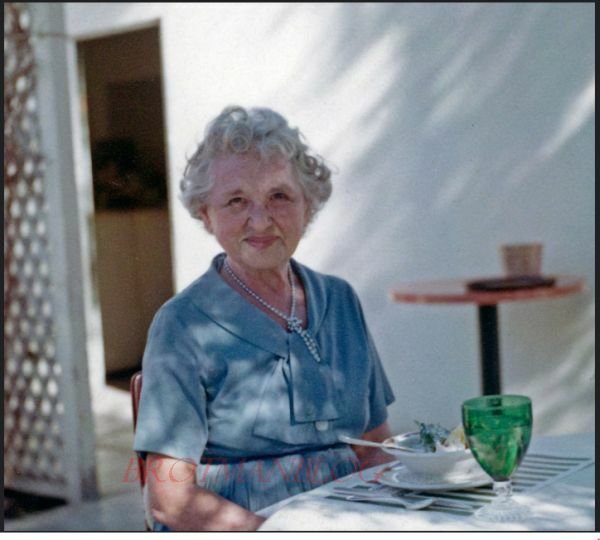 All excerpts from Frieda Loewenherz’s memoir and all the photographs in this post are published with the permission of Franz Loewenherz, her great-grandson. My deep gratitude to Franz for his generosity. It was an importing firm, headed by an Austrian, Dr. Sokal, a brilliant man, Dr. of chemistry. . . . My work was interesting especially since a new project was to be worked out. It entailed the representation of a German firm in Cologne manufacturing accumulation plates for lead batteries and the import of them. I carried on the German correspondence, translating into English formulas, etc. and finally the contract. After a few weeks a new member of the firm arrived from Europe where he had been traveling and visiting his family in Leinberg and Vienna, etc. 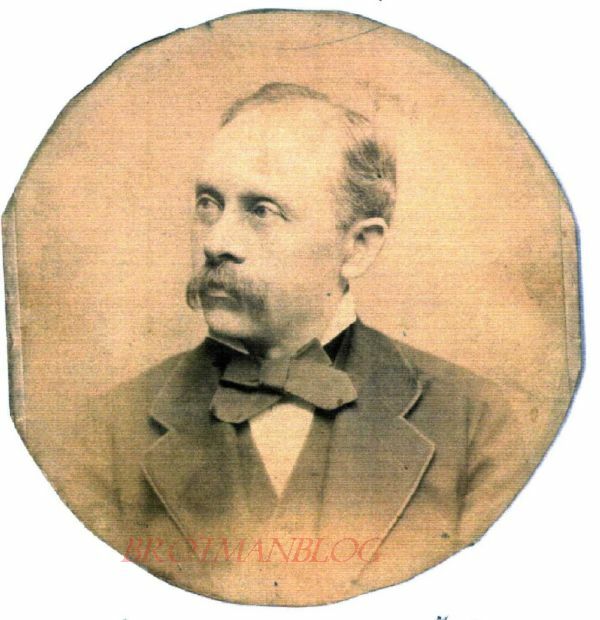 He was an engineer, Mr. Emanuel Loewenherz. Little did I think at our first meeting that I had met my destiny! For a while their outward relationship was “strictly business,” but it seems that from the beginning their feelings were more personal than that. In those days there was much more formality. We were both European born and reared and the rules were even more strict. Nobody could help being impressed by Mr. L’s bearings, his impeccable manners and old world politeness. And he was startlingly handsome! He was a graduate of the technical University of Berlin, widely travelled and very cultured as was his background. 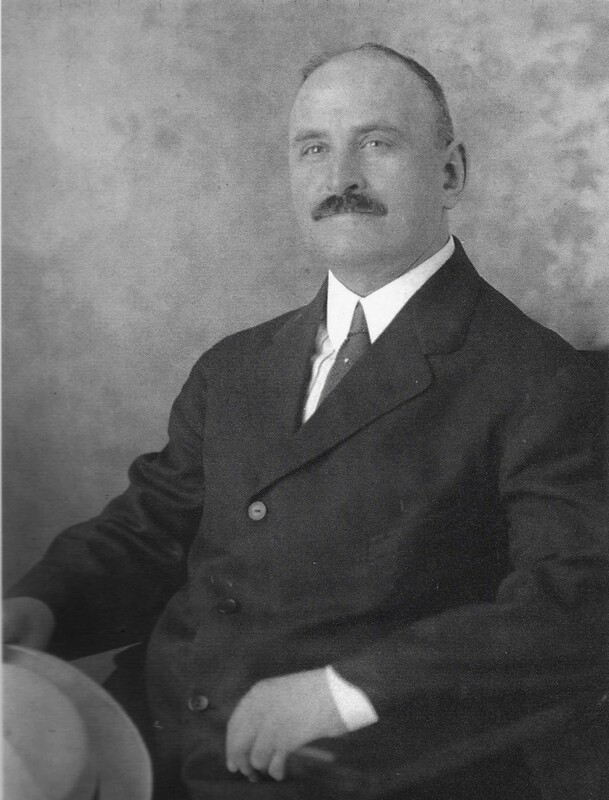 Before going to Europe he had been for many years with the Western Electric Co., also held important positions in New York. Little me was awed by this cosmopolitan man of the world! Now and then we had little conversations not related to business and I thought that would be as far as it would ever go…. But in the spring of 1914 when I was again planning to see my parents and was given a leave of absence, Mr. L. invited me to dinner as a “”farewell party” at the Bismarck Hotel where he was at home, the owners being his friends. I was so excited I could not eat! The excellent dishes, the wines, ordered by a real connoisseur practically remained untouched by me. But we had a fine evening and I was walking on air! My friend Clara A. and two other girls who were traveling with me had the usual send off at the station, friends, relatives, a regular delegation. “He” arrived with a great bunch of red roses and created quite a sensation. He was also the only one who did not kiss me goodbye — One of the girls whispered to me: “Frieda, red roses, that means something!” All I answered was “don’t be silly.” I think I even meant it at that time- I was so unsophisticated! And then, on the boat, there was a special delivery letter awaiting me and a little later, a beautiful fruit basket was delivered to my cabin. I was speechless – Of course, I wrote him a warm letter of thanks, but rather formal – it was the trend of the times. It was June 28, we were sitting at a table of a sidewalk cafe when suddenly [newspaper] “extras” appeared. We grabbed one — the headline said: “Austrian heir to the throne, Prince Ferdinand and wife, assassinated at Seraguro[Sarajevo]!” The shock was terrific, and we knew at once that this would mean war — there was, of course, hope it could be averted….the war clouds grew darker each day — the German press told us very little and only from their angle. Propaganda against Russia was vicious. And then came partial mobilization – and with it the spy craze, suspicion and all ugliness. The railroad, bridges, etc. were guarded by civilians pressed into service and rumors flew around day and night. On July 28 war started by Austria against Russia was declared and on August 2nd England declared war against Germany–World War I was on! Germans were a war loving people, their enthusiasm was boundless, they thought the war would be over that Christmas and, of course, they would be victorious. My brother [Julius Bensev] and I had our own thoughts and personal concern: how to get back to America! We had return passage on the Hamburg America Line and the British blockade was tight. Our parents were worried for our sakes — we worried about them. Anxious weeks followed: We spent much time at the railroad station, to watch the mobilization. The military trains, westward and eastward bound, rolled in day and night, only about 15 minutes apart….The local women and young girls would meet the trains offering all kinds of food – this happened at every stop. Meanwhile the young men of my hometown had all left — each knowing where to report to his unit — I waved to many as they rode by, some never to return. This month of August also brought in the first trains of wounded and prisoners of war. Of course the papers only reported the wonderful victories and, as if it were the most logical thing to do, the invasion of Belgium. There was no radio or TV in those days, and the papers brought only the German version, and only the censored. At last we got word that it was feasible to reach Holland from where we hoped to get passage to the United States. To say goodbye to our parents was even worse this time under prevailing circumstances and they were very worried about our safety. After several delays and obstacles, Julius and Frieda were able to board a ship from Amsterdam to New York, crowded with many others seeking to leave Europe. It took us ten days to reach New York — it is hard to describe my emotions when I saw the statue of Liberty! There were tears of joy and I was not ashamed of mine. I did not do much work the first few days, and I must confess that I was rather excited at seeing “Mr. L” again! As he stated much much later when we had become friends that he was concerned when and how I would be able to get out of Germany. …. Our personal relationship kept growing although still rather formal. It was the trend of times and our upbringing! …. We eventually addressed each other by our first names but with the prefix “Mr.” and “Miss”: how times have changed — I was so careful not to show my feelings and interpreted his as just being friendly. I blushed so easily in those days! During the day it was, of course, all business but when we went out which we did quite often, to dinner, plays, and concerts, I thrilled at the sight of him — but held myself in check and would not for the world reveal my feelings. I knew he was not indifferent either! His looks and attitude spoke volumes and we became better and more intimate friends. We had a great many interesting discussions and occasional differences which added spice to our friendship. He later confessed that he led deliberately up to those to tease me and to see how well I could control myself! I had a flair for poetry and often after a particularly stimulating evening I would write a little note in verse to him. And so the years passed, filled also with anxiety about our families in Vienna and Germany. It is impossible for me to describe the conditions here, hatred of the “Huns” or as the French called the Germans “Boches”– The history books have recorded all and I will contain myself to relating personal events. As “enemy aliens” we were both under suspicion. The amateurish American Protective League did in their zeal more harm than good. My room was ransacked while I was at the U.S. Dept. being questioned about my father’s activities, etc. My “Crime” consisted of getting an occasional note from a friend in Denmark who was in touch with my parents and my answers to them relayed by her. Just a few words to know they were alive. Finally I was released and returned to the office. 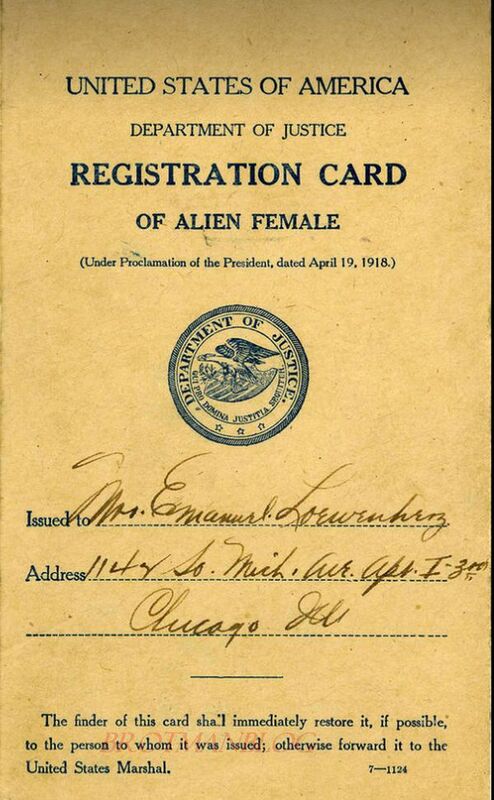 Although I had learned about the anti-German discrimination that existed in this country during and after World War I, reading about it from the perspective of someone who experienced it directly—a young woman who had been living in the US for ten years and whose brothers had already become US citizens—was much more disturbing than reading about it in history books. Despite those dark experiences, Frieda and Emanuel’s romance continued and deepened. So things went on with us in a more normal way. Of course we did not speak German on the street or public places, only when we were absolutely sure that we could not be overheard. And there were things that we felt we could only express in that language. It became more and more intimate! I knew I was madly in love with him and felt that he was not indifferent. (Anything but — his looks and actions, yes, and his kisses when he took me home after an evening date expressed his feelings only too well). As he told me later he was in love with me long before I had any inkling but was not ready to declare himself. We were both mature people and our friendship was not based on Saturday night dates, we faced every day life in all its aspects together, war having a special meaning. Love can conquer all and it did! On February 5, 1918, the fifth anniversary of their first meeting at KW, they became engaged to marry, and on May 4, 1918, they were married. 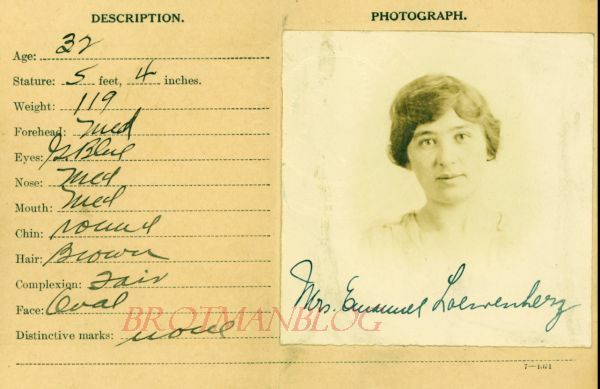 Emanuel became a US citizen in December, 1918, and as his wife Frieda automatically also became a US citizen. The war had ended a month before, and life returned to normal for the newlyweds. But life would again become more complicated, as we will see in the final post based on Frieda’s memoir. 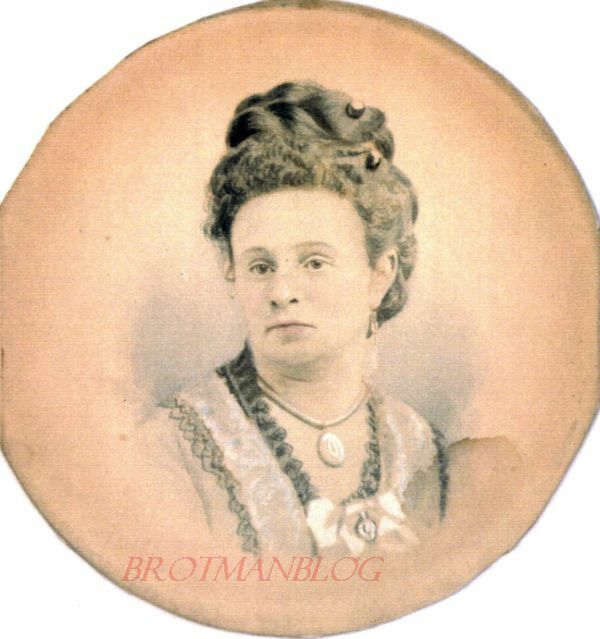 In the last post I published before Thanksgiving, I wrote about the two daughters of Breine Mansbach and Jacob Bensew, Roschen and Frieda. They were my grandmother’s second cousins, my second cousins, twice removed. They were the great-granddaughters of Seligmann Goldschmidt and Hinka Alexander, my three-times great-grandparents. 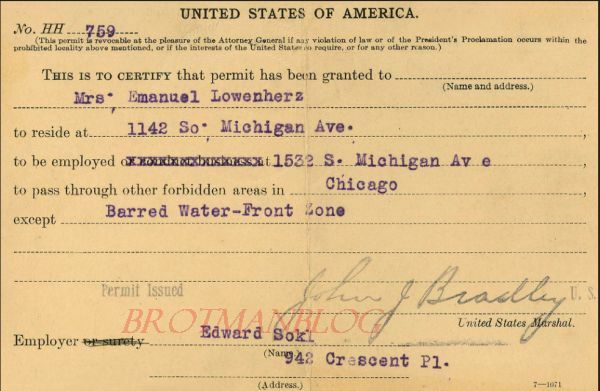 After publishing that post on November 16, I received a wonderful treasure trove of pictures and documents and information from Frieda Bensew’s great-grandson, Franz Loewenherz, my fourth cousin, once removed. Among those shared items was an almost 60 page memoir written by Frieda in 1970 when she was in her eighties (with an addendum written in 1972). Reading that memoir moved me to tears—not because Frieda had a hard or sad life. To the contrary. She wrote about a life filled primarily with love and happiness—parents who adored her, a marriage filled with deep love, an adoring son and his family, and an extended family that she cared for and about and who cared for and about her. 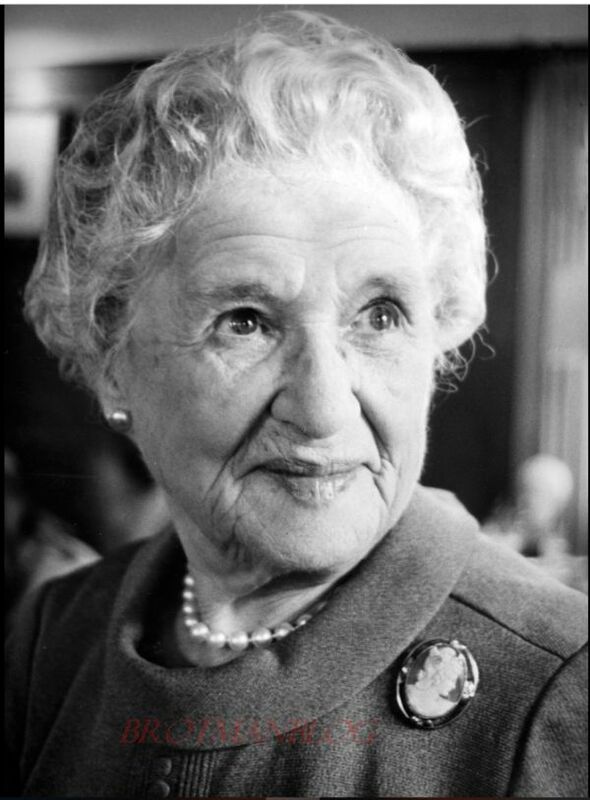 Of course, there were heartbreaking losses and difficult challenges, but throughout her memoir, Frieda’s love of live and her gratitude for all she was given came shining through. 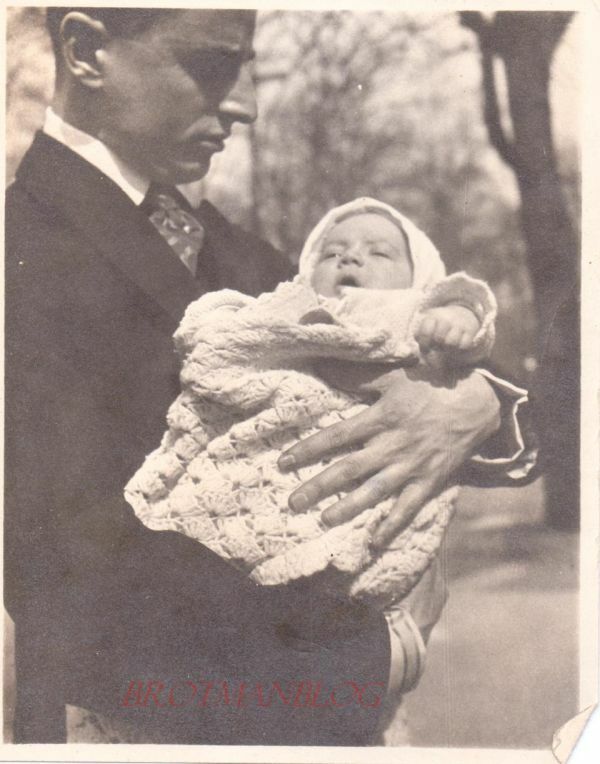 With the permission of her great-grandson Franz, I want to share some of this memoir and also photographs of Frieda, her husband Emanuel Loewenherz, and their son Walter. Not only is this a touching life story, it has value not only for what it reveals of family history but for its insights into the times in which Frieda lived. [Melsungen] was situated in a valley on the river Fulda, surrounded by beautiful woods. A climb of 15 minutes from my home would take me into the thick of them. Oak, Linden and Pine exuded that spicy fragrance remembered for all time. Of course in the summer when school was out this was my favorite outing. But I had also some duties to perform, not just picnic, and that was berry picking! With my friends I would start out in the morning, provided with sandwiches and a pail. It was blueberry time and our ambition was to come home with a full pail. Sitting under trees in a blueberry patch, with the sun filtering down, bees humming around us, we often had a very extended lunch hour! Our dessert were berries eaten right from the bushes. We had to hurry to finish our work as we had to be home before sundown, picking wild flowers on the way. My mother would be pleased with the crop to be used for cake, preserves and jelly. She was not so pleased with the condition of my white undies, full of squashed blueberry stains!! Winter’s great recreation was ice skating on the river. The ice was so clear, it looked green and one could see the plant life beneath it, moving according to the current. The surface was like glass and I took many tumbles! In those days there were no snow or skating outfits. I wore woolen petticoats, long knitted black wool stockings, flannel pants. When I got home my petticoats and dress usually would stand out like a ballerina’s lampshade – frozen stiff! My mother would receive me with a warm drink and a piece of black bread after getting into dry clothes and warming myself at the stove. There were many simple pleasures, another sledding down a hill or when my father would take me along in the sleigh drawn by our horse, with hot bricks at our feet. The floor of the sleigh covered thick with straw. When we stopped at a village inn, my father would let me take a sip of his grag! 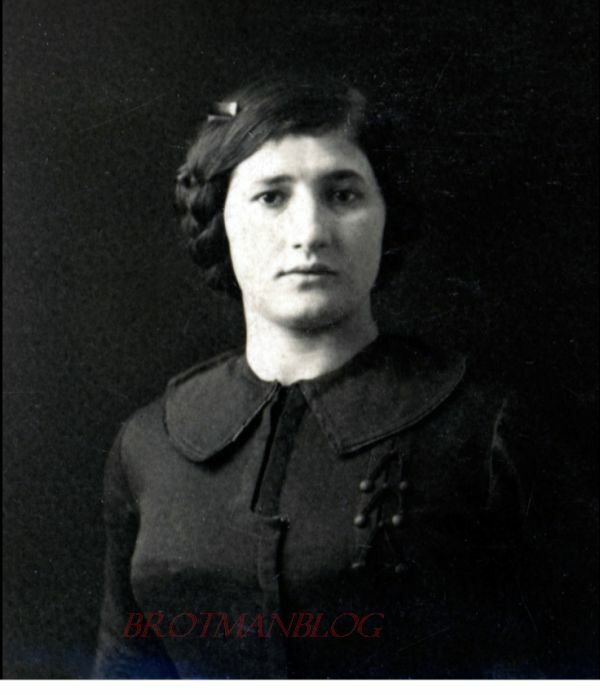 Frieda seemed to have a special relationship with her uncle, Julius Mansbach, her mother Breine’s brother who had, like all of Breine’s siblings, immigrated to the United States. 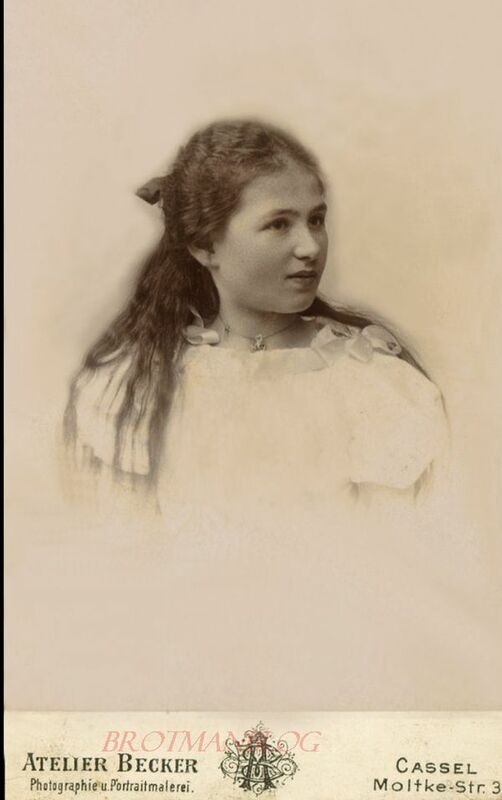 But Julius returned to Germany and visited Frieda when she was fourteen years old or in about 1900. My happiest recollections are, from the time I was 14 when my Uncle Julius, my mother’s youngest brother, came to visit us from America. He took me along on so many day trips to historical places, one of them the famous Wartburg, where Martin Luther was imprisoned and where he translated the Bible. And, of course, it is the setting of Wagner’s opera “Tannhaeuser.” I learned history on authentic grounds. With my uncle I saw my first American circus! Barnum and Bailey, with Buffalo Bill and his wild-west show were touring Germany then and we saw the performance in Kassel. The clowns told their jokes in English, naturally, and my uncle would translate them to me. The three ring performances left me breathless, as did the riding skill of the Indians. This was an unforgettable summer. I was so grateful to my uncle, not alone for providing so many pleasures of various kinds for me but he also was the one who taught me quite a few English expressions and the first rudiments of the language. 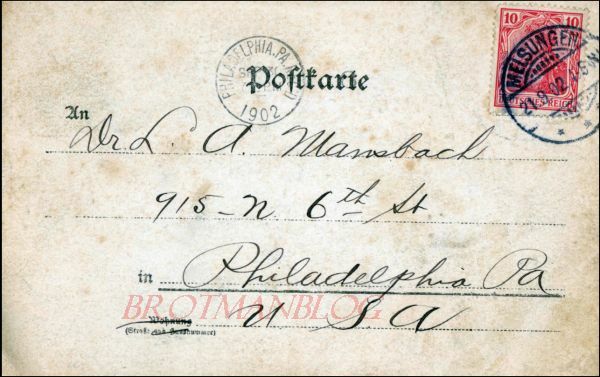 Frieda’s ongoing relationship with Julius as well as her uncle Louis Mansbach and grandmother Sarah Goldschmidt Mansbach as well as her use of English can be seen in the postcard she sent on September 21, 1902. 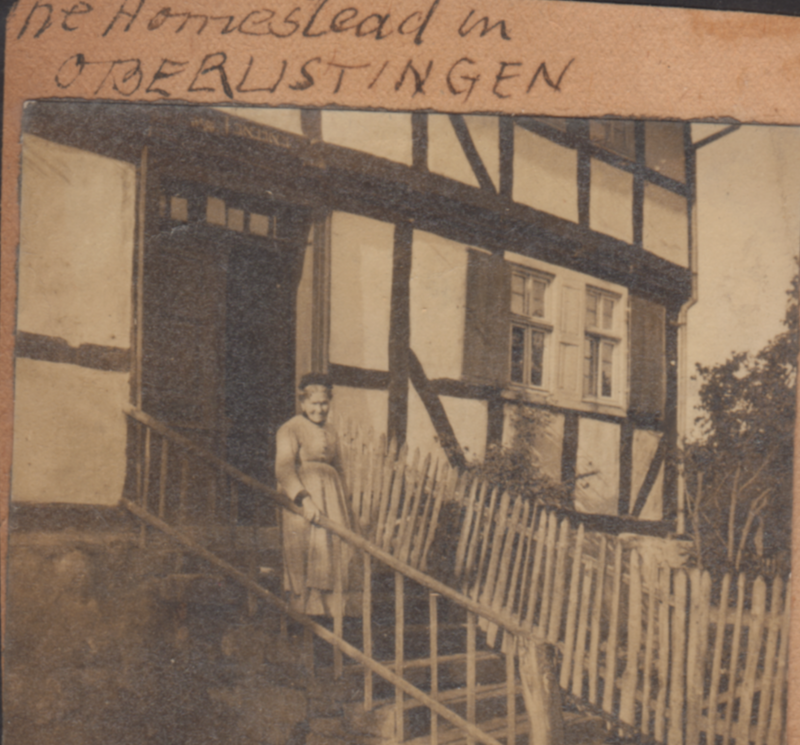 The photograph is of Frieda and, I believe, her uncle Julius, probably taken while he was visiting the family in Melsungen. Unsere Karte von Cassel aus habt Ihr bei dieser Zeit hoffentlich erhalten, morgen ist es wieder ein heisser+ nasser Tag, wo Willi + Heine uns verlassen. Was denkt Ihr vom nebenstehendem Bild? Ist es nicht beautiful? Ende dieser Woche erwarte ich sicher einen grossen Brief von dir, sowie die Ansichtskarte. I believe Fritz was Frieda’s nickname. Meine Lieben haltet den Jontef Cholent warm. Translation: My dears, keep the holiday Cholent warm. Hast du die K. abgeliefert? Wenn nicht, bekommst du keine wieder von mir. Translation: Did you deliver the K? [card, I assume] If not, you won’t get another from me. The left side is mostly in English; at the top it says “Best regards to Uncle Louis, Aunt Cora, and Rebecca.” This would be referring to her mother’s brother Louis Mansbach and his family. Under the picture it says: “Im “Fidelio” war es grossartig [“Fidelio was fabulous]. If you, dear uncle, come again, I will sing the “Arien” [arias] for you. Don’t stay long! Otherwise you are well.” I assume this was directed to her dear uncle Julius Mansbach. It was only natural that I wanted to go to America. Most of our family lived here, from three generations back. My grandparents [Sarah Goldschmidt and Abraham Mansbach] had come to Philadelphia where most of their children lived and some in the west, in Colorado. My mother [Breine] was the only one who remained in Germany as she had a family and my father refused to leave. When the time came for me to investigate, I did so with the promise of my parents that they would follow after I had familiarized myself with my new surroundings. My disappointment was great when my father declared he changed his mind. They did not wish me to return, however, insisting that I had a right to my own life. That is how loving and understanding and unselfish they were. This paragraph touched me deeply— thinking of Frieda’s courage and determination and her parents’ respect for it. And yet I also could feel how torn both she and they must have been about this separation. After a few months of visits with my family in Denver I had acquired quite a vocabulary and felt able to enter an American School of business. There I studied besides English, correspondence, shorthand and light bookkeeping and typing. I knew German shorthand, and the switch was not easy. It required extreme concentration as, in addition, I did not know business language and form either. Well, I made it and kept step with my class, all American born. I finished even ahead of time and got my first job shortly after. And what was the requirement? German shorthand! The irony of it all! 90% of the dictation was in German and 10% in English. My Aunt Hannah [Mansbach Dannenberg] and Uncle and their three children made our visit of a few days most enjoyable, Rita the oldest was engaged, Arthur a medical student at the U. of Penn. And Katrinka, the youngest, showed us the sights. We had a lot of fun! Then on to New York. My uncle Julius-who was in this country on business from Germany (he had returned there a few years before with his wife, my cousin Frieda on account of her parents’ wishes) entertained us royally. In this one paragraph I learned three things. First, that Frieda and presumably the other Bensews were very much in touch with their mother’s Mansbach relatives in the US. 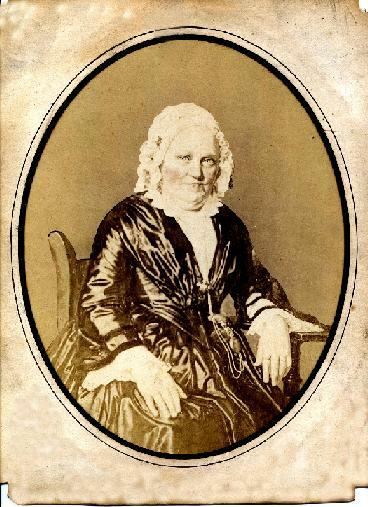 Secondly, that the Frieda Bensew who married Julius Mansbach was in fact related to this Frieda Bensew and her family (though I still don’t know how). And thirdly, I learned why Julius Mansbach had returned to live in Germany—to satisfy the wishes of his in-laws. And then came the time to say good bye again. It was not easy – My parents were so kind and understanding.They realized that I had outgrown my old environment and that my opportunities for a fuller life were so much better in America, the land which I loved and do to this day. Perhaps, being foreign born, gave me even a deeper appreciation of the freedom and privileges so many seem to take for granted. 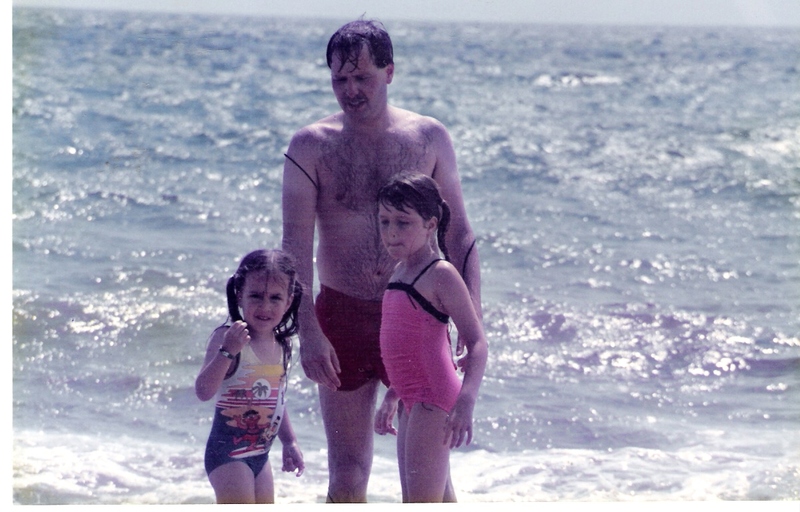 My parents and I were grateful for the time we spent together and kept up a brave front at parting. She stopped in Philadelphia on her way home and was invited to stay for her cousin Reta’s wedding that coming December. She had a wonderful long visit there, and then after the wedding she received a letter from her brother Julius about a new job opportunity in Chicago, so she left to start her new job. That decision was life-changing, as we will see in the next post. Amelia Mansbach and her husband Henry Langer died in the 1920s and were survived by their two sons, my grandmother’s second cousins Joseph and Lester, both of whom were career photographers, Joseph for The Denver Post and Lester as a dark room technician. We saw that in 1930, Joseph was still living in Denver,1 but Lester was living in Kansas City.2 Neither brother was married at that time. Lester was a lodger in what appears to have been a large boarding house in Kansas City, and Joseph was living in a hotel in Denver. This post will look at their lives in more depth. 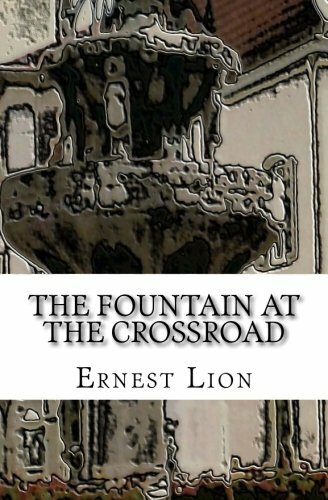 It was a challenge to learn much more about Lester, the younger of the two brothers. In 1940 he was still living in Kansas City, working as a photographer, and living at the Washington Hotel. 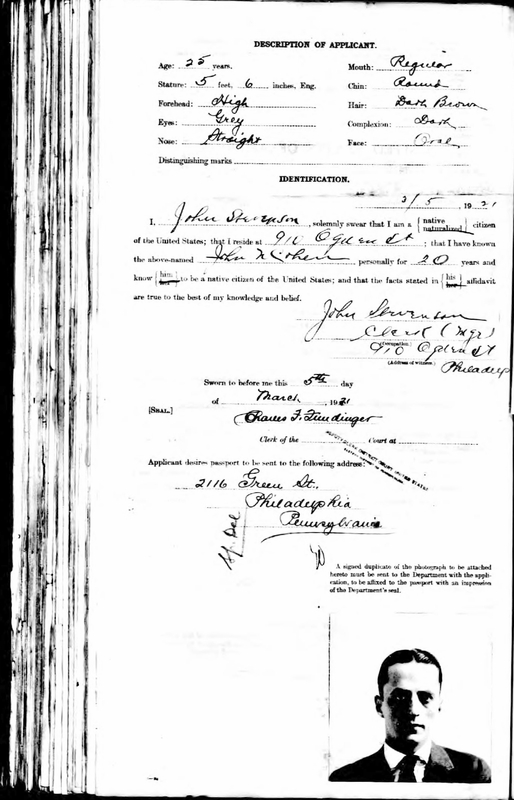 According to the census record, he was married, but I found no other indication of a marriage, and he is not listed with another woman named Langer at the Washington Hotel.3 I believe this was an enumerator mistake, or Lester was lying. 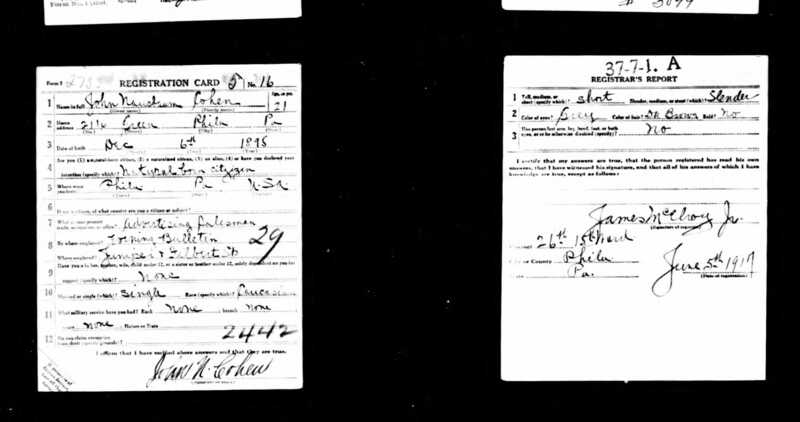 After all, he had listed his mother as his wife on his World War I draft registration. 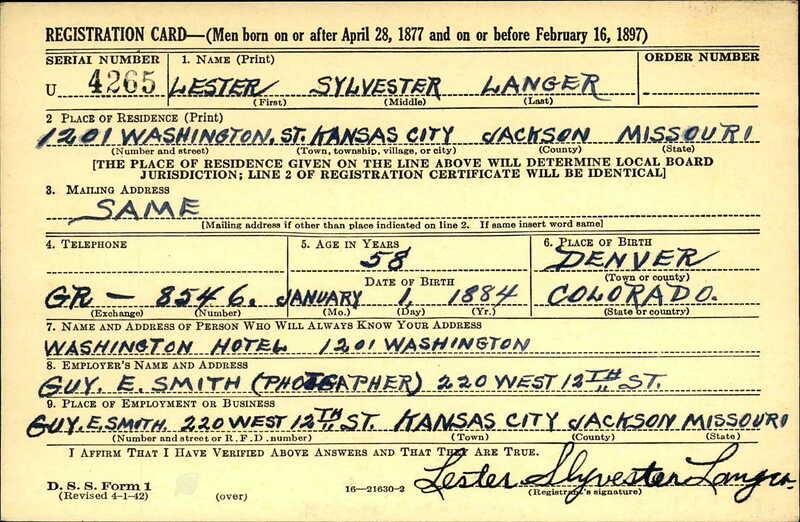 Lester was still living at the Washington Hotel two years later when he registered for the World War II draft (he was then 58 years old). And he was still working as a photographer—for Guy E. Smith. The only other reference I could initially find for Lester was an entry on FindAGrave indicating that he died on March 19, 1960, and was buried at Temple Israel Cemetery in Memphis, Tennessee.4 I contacted the synagogue affiliated with the cemetery where Lester was buried, and the archivist there told me that there are no other Langers buried there and that Lester was not a member of the congregation. I was not sure where else to look to learn more about Lester and how he ended up being buried in Memphis. So I joined the Tennessee Genealogy group on Facebook, and a very helpful member named Shannon located Lester’s death certificate, which opened the doors to the rest of his story. 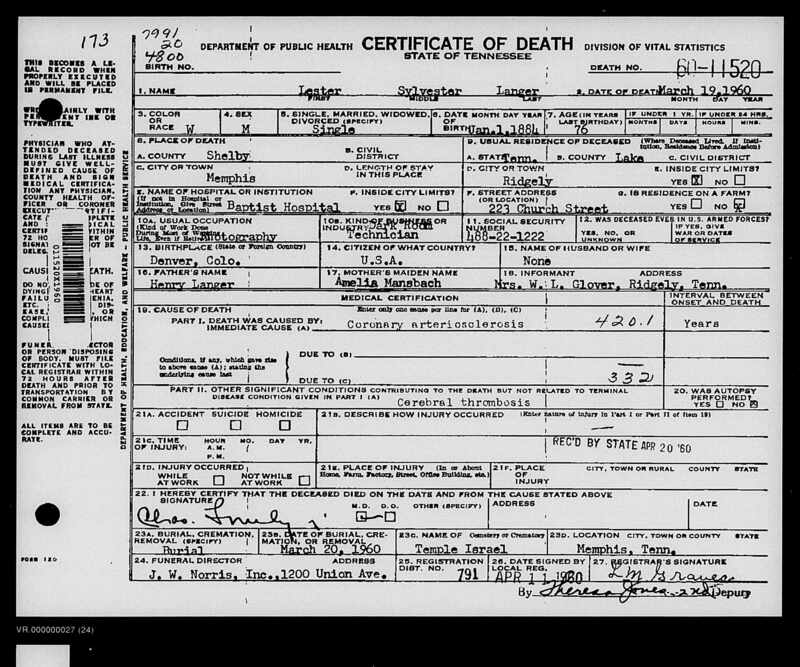 Lester Langer death certificate, “Tennessee Deaths, 1914-1966,” database with images, FamilySearch (https://familysearch.org/ark:/61903/3:1:3QS7-L9DL-CF56?cc=1417505&wc=34DM-BZS%3A1580614801 : 15 October 2018), 007552516 > image 33 of 2310; Tennessee State Library and Archives, Nashville. Lester had died in the Baptist Hospital in Memphis, but was residing at the time of his death in the tiny village of Ridgely, Tennessee, located about 100 miles north of Memphis. Ridgely’s population in 1960 was 1,464. Why was Lester living there? His death certificate indicated that he was still a photographer working as a darkroom technician. From the obituary I learned that Lester had moved to Ridgely, Tennessee in 1954, just six years before he died, to work with W.L. Glover, a “nationally known livestock photographer,” who had purchased the photography business of Lester’s Kansas City employer, Guy E. Smith (the name mentioned on Lester’s World War II draft registration card) in 1952. The obituary said that Lester had worked for Smith for twenty years, so dating back to 1930 or so, when he was living in Kansas City. Then I contacted one of W.L. Glover’s sons, Jere, who remembered Lester well and told me that Lester had also spent time in Hollywood where he did photography developing and printing for movie studios. From what I already knew about Lester’s career, I assume that he must have been in Hollywood sometime after 1920, when he was still in Denver, and before 1930, when he was already in Kansas City. Those must have been exciting days in the early years of the movie business. Unfortunately Jere did not have more details as he said that Lester had not talked very much about his Hollywood days. Jere also told me that Lester “was well liked by everyone in the town. He had a good sense of humor and was a truly nice person.” He thought that Lester was probably the only Jew in the area. Nevertheless, Lester had held on to his Jewish identity. His funeral was officiated by a rabbi, and he was buried in a Jewish cemetery. I found it particularly touching that a small number of residents of Ridgely, including the Glovers, traveled all the way to Memphis to attend the funeral, as noted in the obituary. 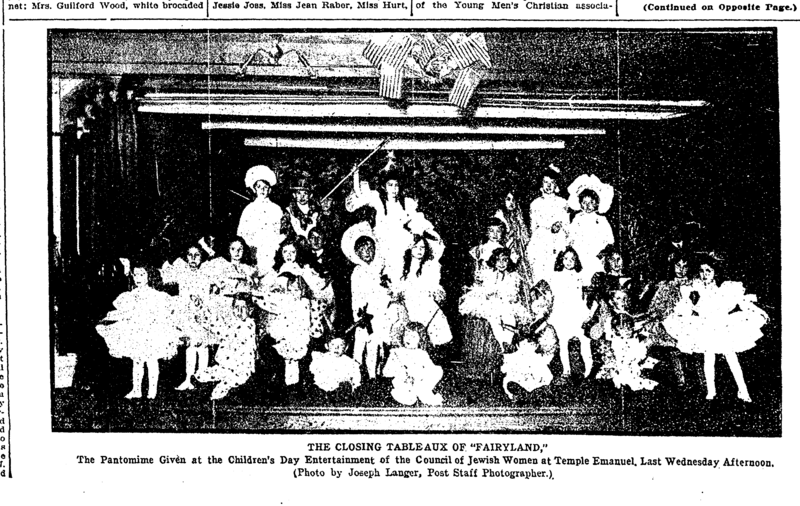 So from knowing almost nothing about Lester, I now have a fairly complete picture of Lester Langer’s life, thanks to the generosity of Shannon from the Tennessee Genealogy group, the Lake County Banner, Temple Israel synagogue in Memphis, and Jere Glover. Obviously, these are not very good quality reproductions of the photographs as they are scans of photographs published in old newspapers, but they give a sense of the variety and volume of Joseph’s contribution to the newspaper. The strangeness of the ways of fate is here again emphasized. All newspaperdom familiar with Langer’s record as one of the pluckiest of press photographers and his hair-breadth escapes in the pursuance of his arduous and hazardous vocation, his daring exploits and his proverbial good luck while on perilous ventures—and now a slip and a trifling fall has laid him up in pain for perhaps six weeks! The article then described some of his feats, including climbing up on the scaffolding on the spire of the new cathedral to get a birds-eye view of Denver and another time climbing up on the tower of a newly completed building, standing in the wind as it swayed, to get another shot of the city. “Joe” has been struck by lightning, burned by flashlight powder, his camera has been smashed, he’s been cursed and lauded, rebuffed and welcomed, but he’s never lost his enthusiasm for the press photography fame, and if there is a better newscamera man in the world. The Post hasn’t been able to find him. … In his twenty two years as The Post’s news photographer, Langer has exposed approximately 90,000 negatives. If those negatives were placed end to end they would make a glass strip all the way from Denver to Arvada. The news of Denver, as Langer has seen it thru his cameras, would fill a library. And the most interesting stories, because they are the inside and the most intimate stories of the big happenings of those one score and two years, would far surpass what has been printed. The article also described some of Joe’s many challenging experiences over the years. I found one manifest for Joe on the SS Resolute in 1929,6 and Joe also traveled to South America in February 1930 on the SS Samaria,7 and in August he traveled on the SS St. Louis to Hamburg Germany.8 It is thus not surprising that I could not find Joe on the 1930 US census. Announcement that “Joe” Langer is dead will be received with sincere regret and sorrow by thousands who knew him during his activities as a newspaper photographer. Until he retired to become a world traveler some eight years ago  he was always at the front with his camera in every important story calling for picturization. No day was too long, no task too difficult to curb his enthusiasm or turn his ambition to be the “unscooped photographer.” The great and humble and all in between were to him “interesting subjects: and his files were a clear pictorial history of the times. ….After the death of his mother in 1926 he decided to see something of the world. He took a world cruise, carrying the faithful camera along, and on his return headlined many club programs with moving pictures and oral descriptions of places he had visited in far lands. 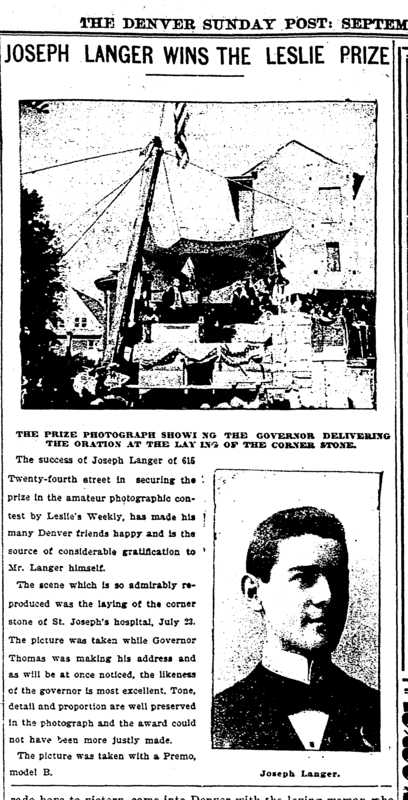 Joe Langer certainly left his mark on the paper and the city of Denver. 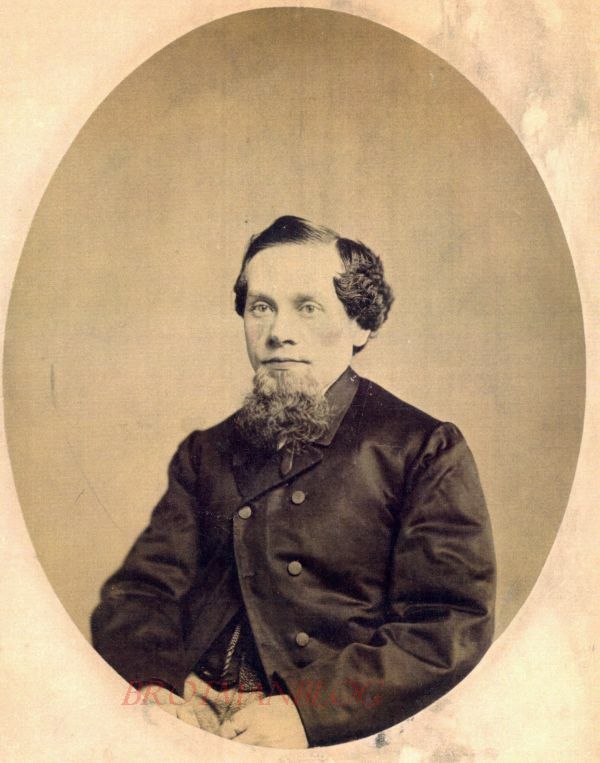 Neither Joseph nor Lester Langer had any children, and thus there are no descendants for them or for their parents, Amelia Mansbach and Henry Langer. The two brothers both had such full and interesting careers in photography, one living in Denver all his life, the other living at times in Hollywood, Kansas City, and finally the small town of Ridgely, Tennessee. I am so glad I was able to learn so much about them and keep the facts of their lives from disappearing into oblivion. How Did I Lose Track of These Photographs? I was cleaning up some files on my crowded hard drive, and I “discovered” a whole folder of photographs of the Goldschmidt family that had been sent to me by David Baron and Roger Cibella back in December, 2017. How had I forgotten these? Some of these photographs are of members of the Goldschmidt family I’ve yet to write about and will be posted when I get to those branches (if I don’t forget about them again). But those below are of the family of Abraham Goldsmith, about whom I’ve written extensively. 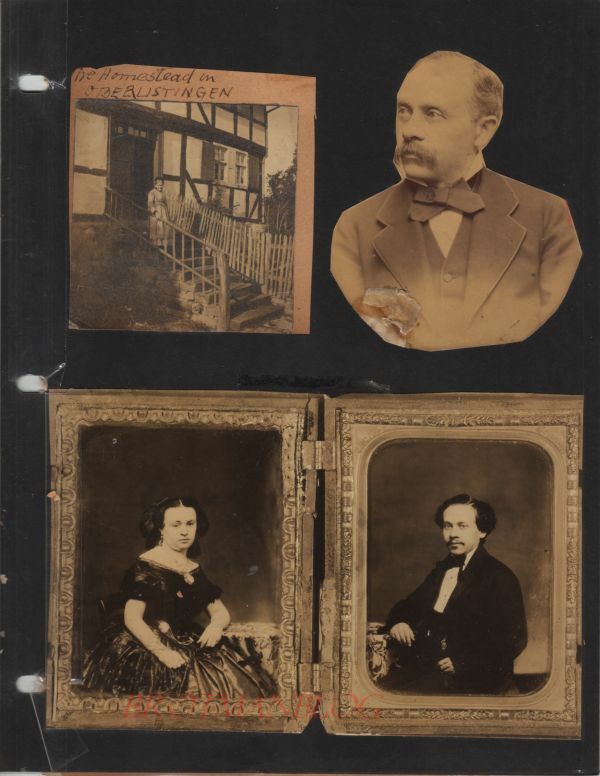 Julian Reinheimer, my third cousin, once removed, and a direct descendant of Abraham through his daughter Cecelia, also sent me some photographs of Abraham and Cecelia and of some of the family graves in Philadelphia. I am going to go back and insert these in the original posts about Abraham and his family, but I want to share them in this new post as well. Thank you to Julian Reinheimer, David Baron, and Roger Cibella for sharing these wonderful photographs with me. First, two of Abraham himself. 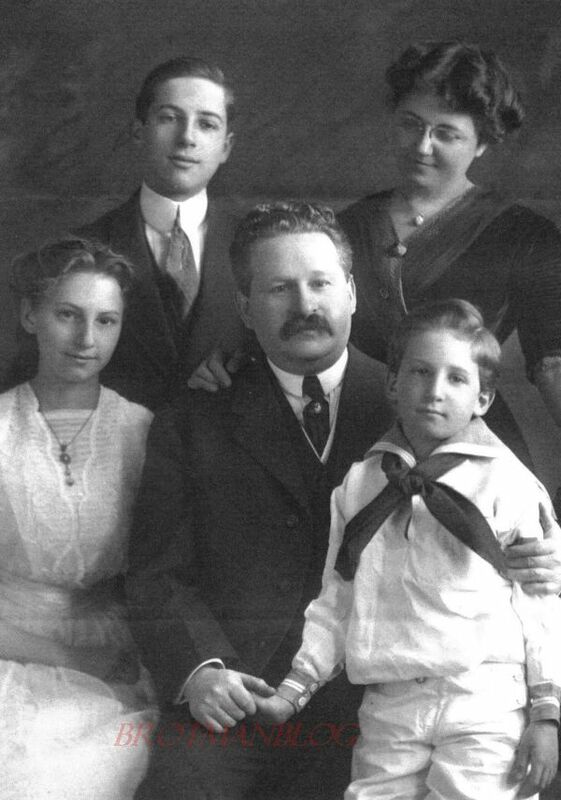 This is Abraham’s son Edwin, the inventor, and his family: his wife Jennie Friedberger, older son Henry, daughter Cecile (named for her grandmother, pictured above), and younger son Edwin, Jr. From the ages of the children, I would guess this was taken in about 1910. 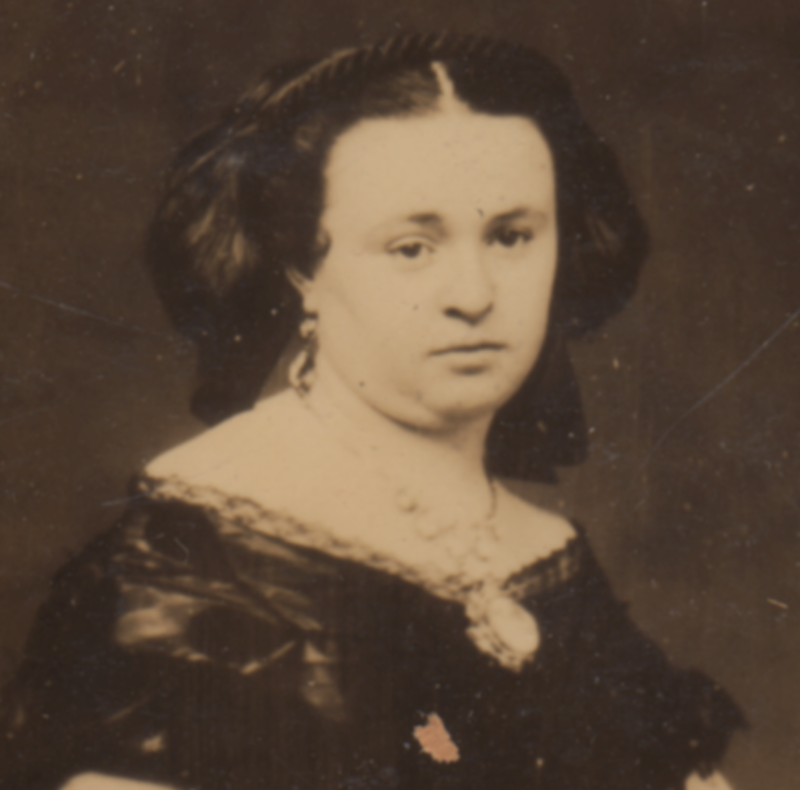 And this is a photograph of Emily Goldsmith Gerson, Abraham and Cecelia’s daughter, who was an author, and who, like her mother, died too young. She was 49 when she died. 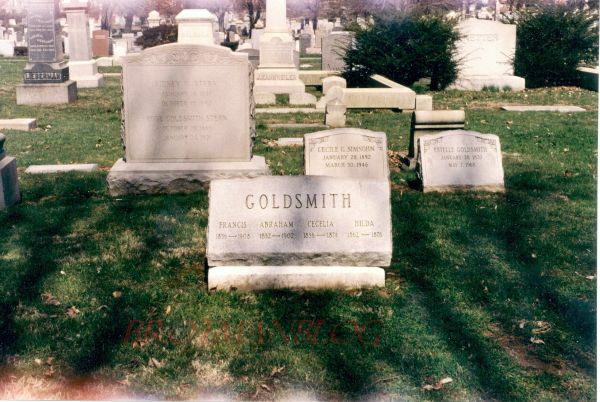 Finally, photographs of the gravestone for Abraham Goldsmith and those of his two wives, Frances Spanier on the left and Cecelia Adler on the right, as well as their daughter Hilda to the far right. Behind their shared gravestone you can see the graves of their other children and grandchildren: Rose Goldsmith Stern and her husband Sidney Stern, Cecile Goldsmith Simsohn, and Estelle Goldsmith. Now I need to go back and add these to my earlier posts. For the next two weeks I will be busy with family—not the ones I research, but the ones who are still here, eating, breathing, and sleeping. Four generations together. I will be back by August 1, but in the meantime, I will try and keep up with all the other blogs if I get the chance. It’s hard to find a quiet moment with this crew around! I hope all of you are having a wonderful summer. 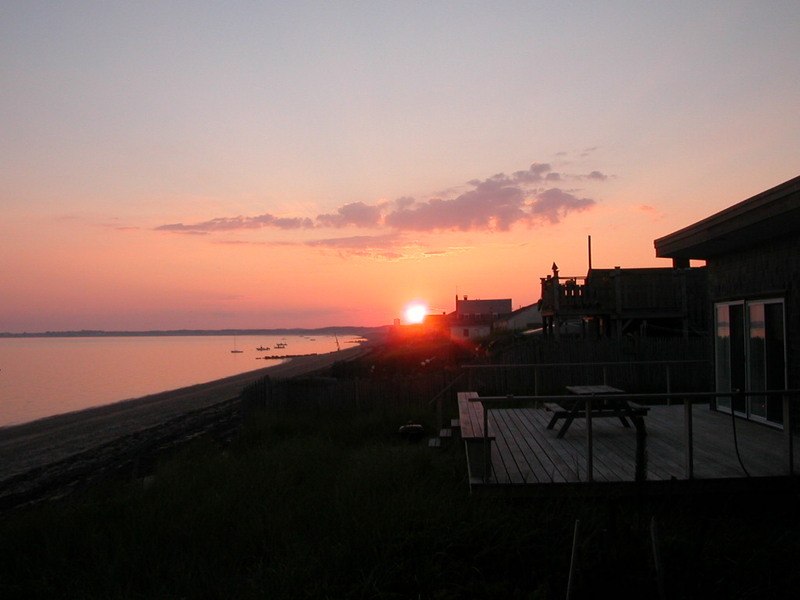 Here are some photos of my favorite beach. 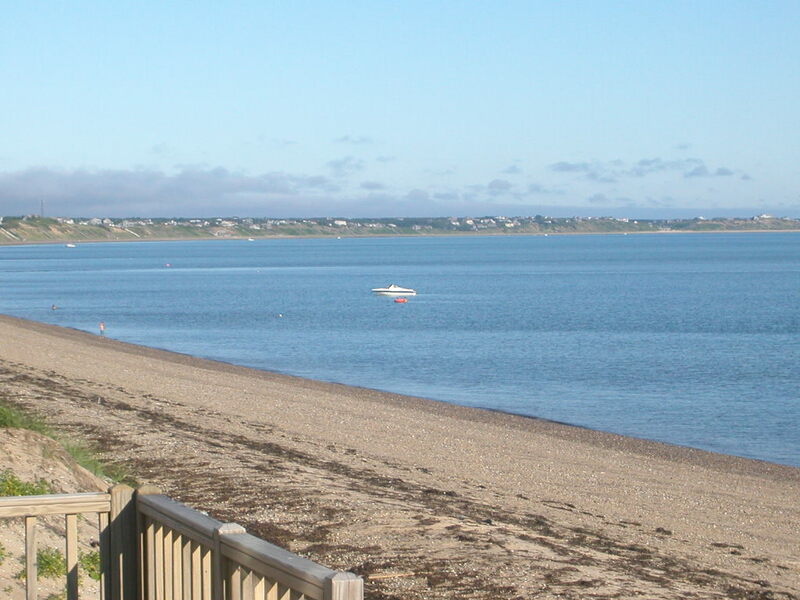 No ancestors lived here, but since 1962, I have spent at least a few days each summer somewhere on this beach. 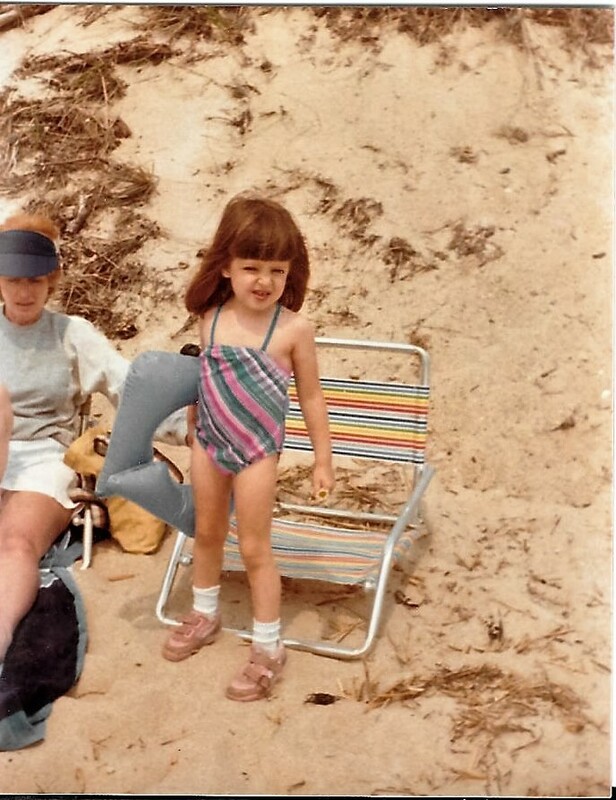 I’ve walked many times along the beach, finding sea glass and shells and heart-shaped stones; I’ve sat on this beach many, many hours with my family—first, as a child, then as a mother, and now as a grandmother. 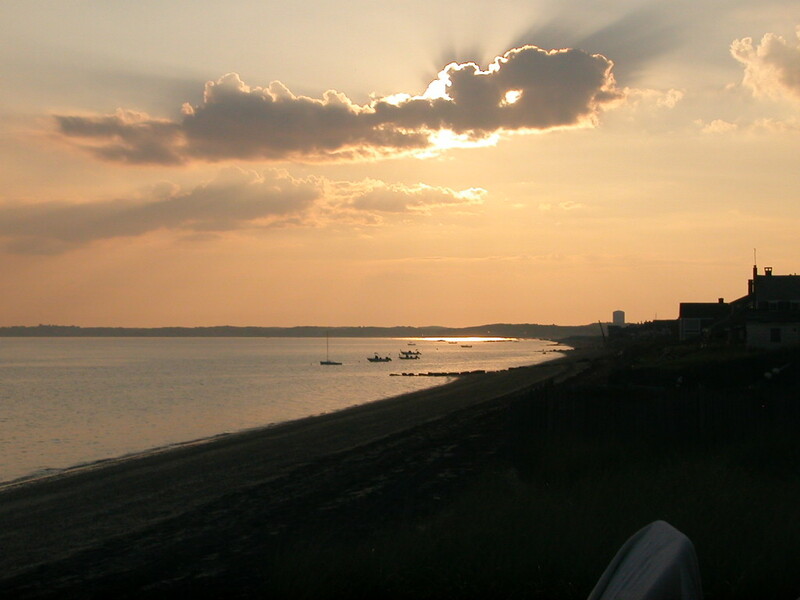 I’ve spent hot days in the warm bay waters, tossed in the waves. I’ve watched storms come in across the horizon, turn the water a dark green, and bring the waves crashing against the sea wall. I’ve watched the tide go in and go out, twice a day, every day. I’ve walked two dogs up and down this beach. 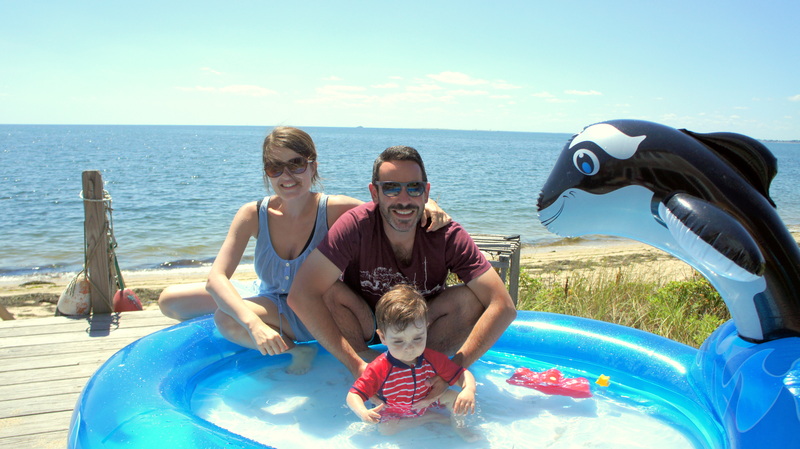 I’ve held my husband’s hand on this beach, my children’s hands, my grandsons’ hands. I may have more happy family memories from times spent here than I have of any other place on earth. Through the years…. 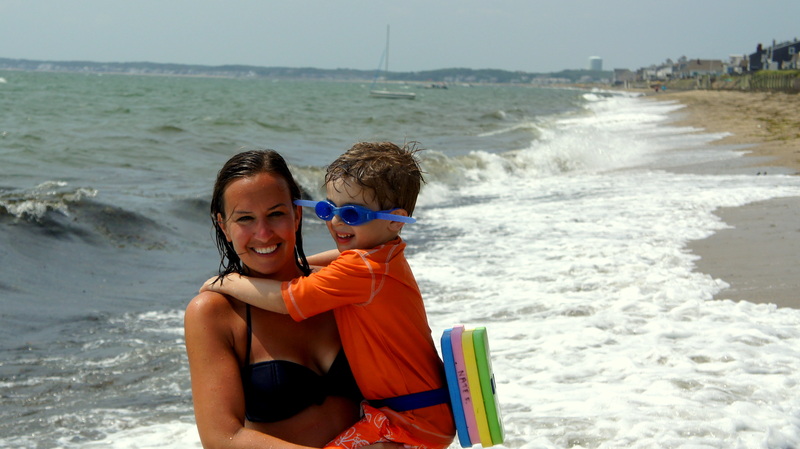 (sadly, I seem to have no pictures on the beach itself before my kids were born).